Since March 2016 I have used a slightly customized seat after Guérinière with some success. For this seat the rider's legs shall be held forwards, "before the horse", and hold this place in most situations. The rider's chin shall be held up and his thoracic spine pushed slightly forward, the shoulder-blades shall wander downwards a little without too much pressing them together in the back, fairly like a 100m sprinter trying to tear the finish tape as the winner. Guérinière's basic stance furthermore contains an upright, over the withers held left fist, in which the reins are led one-handed on a sole curb-bit, with the upper rein between 4th and 5th finger and the lower rein running around the little finger. The thumb's nail is on top, the little finger at the bottom. The rein-fist stands nearly perpendicular, seen from the side as well as seen from the front, it is tilted ab. 10° to the left (supinated 10°) and this stance in riding straight forwards will be varied only minimally. The thumb always points to the front and lies parallel to the horse's spine column. For a bending to the left the switch will be held parallel to the right side of the hores's neck, to push the head to the left, for bending the horse to the right, itthe switch is held crosswise over the neck: both reinforce the outer, bending away from itself rein). If the horse is not educated very well and the right rein has to be held by the right hand separately sometimes, the switch-hand is positioned lower than the rein-hand, otherwise both hands are kept on the same height and near to each other. To train this special seat-balance, I use the lower switch-hand very often, even without leading the reins separately. 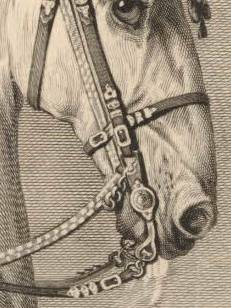 Gueriniere's favorite curb bit was a "simple canon", a snaffle-curb with a broken bit, which allows leading s.t. with separate reins to be far more exact than with an unbroken mouthpiece. For collection Guérinière lifts the rein-fist, and for advancing he lowers it. My customization is, that for advancing I will push the PIP-joint (joint between proximal and medial phalanx) of the rein-fist's little finger forwards (which I call the "Pinky-Push") and by tilting this way the rein-fist backwards (as if you want to touch the middle of your forehead with an imaginary switch held perpendicular in the rein-fist): in extreme the rider then can see the base-phalanxes of the second to fourth fingers. The result is a radial (to the radius bone) kink of the wrist. In this occurs a strong tendon tightening over (radial) and under (ulnar) the wrist, reaching up to the middle of the lower arm. For collection however I will pull the little finger backwards to my belly and by this tilt the fist to the opposite direction through this motion: in extreme, the rider cannot see the nail of his thumb anymore (as if you would touch your horse with your imaginary perpendicular held switch in the rein-fist right between the ears). This results in an ulnar (to the ell = ulna) kink of the wrist. The movement in the carpal-joint is similar to the one of the lower hand on the single paddle in a canoe during backwards paddeling,the resulting tension in the rider's back-muscles are similar, too. This movement I call "Pinky-Pull". In both cases the thumb will hold its place, building the rotating point. The switch-hand is held on many of his pictures, too (supination is a palm held upwards [imagine eating soup out of your hand] ) (the opposite, holding the hand of the back upwards would be called “pronation”). Only the supination (or at least upright-standing) of the rider's hands creates the necessary space for the rider's belly to come forward (pronated hands prevent this! ): I call this "the belly before the horse". A Pinky Push of the switch-hand is possible, too, but for that it has to give up the supination and use the upright position. The gaining in advancing happens very spontaneous: even while pushing forward the little finger it is already starting, continually like one would take pressure off a steel-spring! But the collection happens so softly, that I always need two or three steps to fully register it. 1. The advancing by the Pinky-Push is not due to bringing it's minimal weight to the forehand, rather it permits the rider's belly coming forward a little, reflexively resulting in a little pelvis-tilt forward. 2. The initiation of collection by the Pinky-Pull is mainly the result of the retraction of the rider's belly as a reflex on the pulling back of the little finger and the consecutive pelvis-tilt backwards. 3. Holding the switch hand in supination results in a little move backwards and a freeing of this side's shoulder, accompanied by an approaching of the rider's right upper-arm to his chest, restoring the equilibrium. 4. Pushing, with forwards held rider's legs, the forefeet down onto the stirrups lets the rider's heels rise up slightly and consecutively lightens the seat through taking the upper-legs' muscles away from the saddle, giving the horse's chest room to rotate freely (this must not be confused with simply pulling up the heels!). Possibly it could be described like this: „The Pinky-Push (tilting of the fist for advancing) leads, via a tensioning of the ulnar hand-abductors to a tilt of the shoulderblade into the ribs, with a straigtening of the thoracic spine and by this a hyperlordosing of the lumbar spine, which results in a forward tilt of the rider's pelvis: with naming all the involved muscles, their movements and possibly their opponents, too. If enough riders will have tested the seat and agree to my assumptions in A, I would be glad to build a discussion platform for everyone willing to contribute to B.
I agree to the opinion that sees the curb as a most valuable instrument. Also I think the one-handed leading of the curb reins is for most occasions the optimum (I use the two-handed leading only in special exceptional cases). My two-month test with an academic hackamore showed a similar result, so one has to assume that cavemore and even the one-handed led cavecon will be possible, too. If, while using the single-handed rein-leading one doesn't want to work with only one dominant rein, which touches the horse's neck only on one side (as seen in the Marc Aurel statue) , but wants both reins to act with equal pressure on the horse's neck, this presets the only possible position for the rein-hand in the middle above the withers : with Guérinière for the straight or bent straight: perpendicular in the middle above the withers, the thumb pointing forwards, being parallel to the withers' length. As now the middle over the withers is occupied already, we have to live with the fact that symmetry for the rider's upper body is impossible: we can only try to find a compensation somehow. The stance of the rein-hand constitutes a minimal supination in the left hand: this effects the approaching of the left upper arm to the rider's chest, were it stays in a relative stable position. Supinating the switch-hand compensates this not only through freeing the right shoulder, but also by the approach of the right biceps muscle to the rider's chest, thus offsetting the effect of the left hand's supination: now the rider is sitting straight again (but not symmetrically!). For turning the horse, the rein-fist will be tilted so, that the thumb (pointing as always to the front) wanders outside with the fist's base staying fast on the spot. The resulting minimal difference of pressure of the reins on the horse's neck results in a prompt and finely tunable turning! To support the right bending Gueriniere positions the switch supinatedly across the horse's neck and the reins to the left side, pushing the horse to the right. 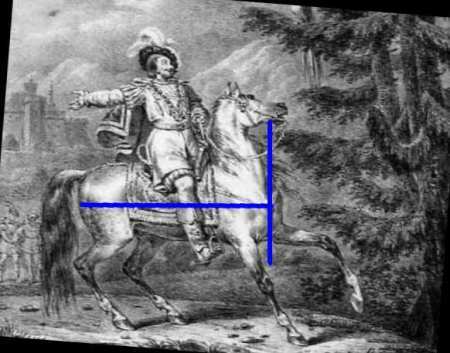 In the left bending, the switch is held at a distance parallel to the horse's neck on it's right side, pushing it's shoulder to the left. My future plan for self-education (under occasional, regular supervision with the high-value help for self-help by Marius Schneider, MAAR) is to train at first Guérinière's basic seat for some more months with the goal of riding at least a third of the time of each riding unit in an approximately good basic seat. Only then I will try to approach the extended seat of Guérinière: Guérinière shows on many pictures another feature: to achieve a more pronounced right-bending of the horse's neck, he uses the little finger of the switch-hand to grab the right rein: so in effect he rides with separate reins! For this Guérinière holds the switch—hand held a fists-height deeper than the left and keeps all the above mentioned features of his basic seat: he “simply” adds the grab of the right little finger into the right rein, which now runs considerably lower now than the left. Doing that the rider needs a very good command of the basic-seat and also of leading separately the snafflecurb-reins, as this very easily produces a hard and unbalanced force on each rein! If one calls his basic seat challenging already, reaching and holding for a certain time his extended seat deserves being called a little mastership, I would say! An intermediate effect is achieved by extending the rein-hand's little finger to the switch-side, pushing with it the rein more pronounced for bending. Meanwhile I see the basic Guérinière Seat as a very reliable foundation of my riding seat, of which the most important pillars are my mostly forward held legs, the 10° supinated rein-hand and the 30-90° supinated switch-hand (the upright fist taken as the reference with 0°, from which up to 90° supination to one side and 90° pronation to the other side are possible). Sometimes still necessary bigger movements of the switch-hand can be leaned on these stable elements very precisely. Most riders will have experienced frustrating situations through the non-reproduceabilty of certain effects on aids: if one, for example, leads the upper-arm of the switch-hand near the upper body, possibly a soft, prompt croupe-out to the opposite side is produced. Having performed this successfully 5 times, one is elated as seemingly a new aid is detected. Then sadly is doesn't work anymore over months !! The reason lies, I see now, at least to a big part in the way of placing the upper arm to the chest: in pronation it has a different, sometimes even the opposite effect than doing it in supination! Because of this I'm now trying to observe always which kind of rotation my lower arm is in: so the thrust of my switch, which I'm using as substitute for a sword/machete, at thistle-heads or bramble-twigs is getting a lot more precise and smoother in supination (like a forehand-hit in tennis or polo: in this movement the considerable capacity for outwards rotation in the shoulder joint enters the game,too! 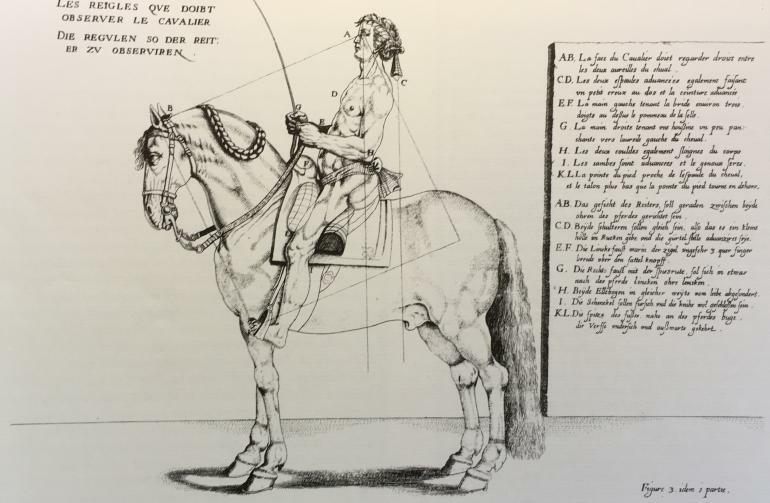 ).Also toucheés to the horse's hind on both sides I perform now only with a supinated switch-hand: if ,on the bent side, I do this around my belly to the opposite side, it will work only in this way: would I try it in pronation, my whole spine would contort and tact and movement of the horse be disturbed heavily. This pronounced rotation of the upper body I use also as gymnasticication of my switch-hand shoulder, which comes forward more and easier (and as preparation for using an instrument on the "wrong" side, too!). One has to be careful, naturally, for the rein-hand not to leave it's place over the withers, which is not easy! The last three sentences show, that I am also still inclined to the utility-riding! The Guérinière-seat meanwhile is pure "L'Art pour l'art". 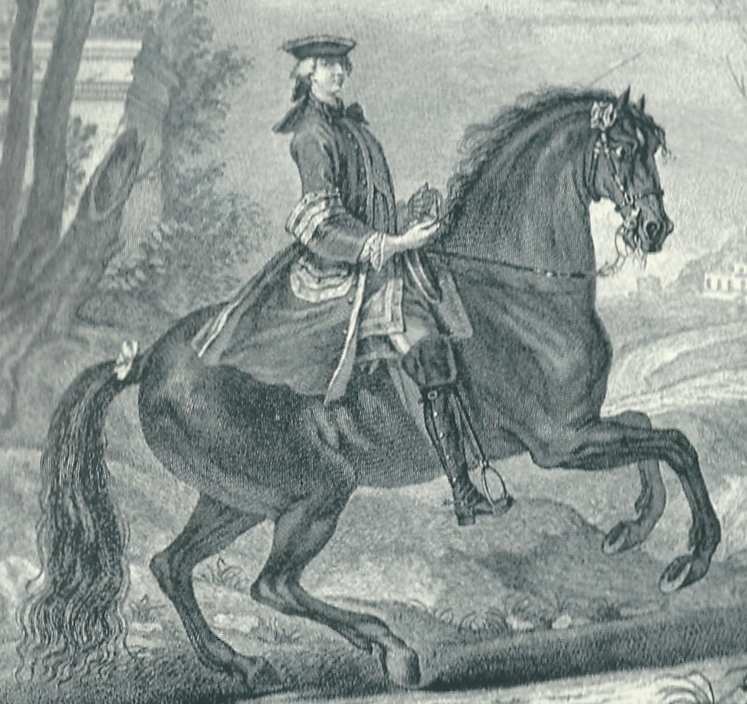 Here the nicest compliment might be, that Baron von Eisenberg (1748) sometime in the future could appreciate my style of riding like he did that of the riding master von Regenthal:" I have never seen a rider sitting more stiffly on his horse or using the advantages especially of the legs better than him! It was a real joy to see him ride,....!" (In the commentary to plate 37 here on page 76). Gueriniere meanwhile was not as free in departing from the utility-riding as to abandon the right-hander-seat. Nowadays we are not so constrained anymore and allowed to use the left-hander seat, too, with changing the rein- and the switch-hand. With this change I can avoid the problems of grabbing the right rein with the right little finger (and thus avoid riding with separate reins), because with changing the reins to the right hand, its little finger becomes much more movable for bending the horse's neck to the right, and also the switch has not the limited range of being put across the horse's neck to the left, as it is used now fully parallel to the left side of the horse's neck to enhance the bending to the right. This means, if we allow to change freely from right-hander to the left-hander seat on demand, it is possible to carry the switch on both hands on the outside of the horse, if necessary! Meanwhile I'm convinced that for riding one-handed this seat will become the new reference-seat in the academic art of riding, against which every other way will have to be measured. Coarse, unprecise aids are discarded entirely, many aids are getting unvisible and the horse moves much more free and unconstrained: the horse's grace stays unperturbed! Through the exactly defined basic-seat the beginner will advance much faster and the developed rider can lean at this structure changes/novelties with ease and evaluate their effects exactly. Possibly we will reach the excellence of a Baron von Eisenberg or a Gueriniere soon and enable many more riders to execute beautiful schools in the air? By applying the Pinky-Push (= pushing forward the PIP-joint of the little finger of the rein-fist) the advancing of the horse gets immensely easier (if need be in combination with a little use of the switch), so that the rider's legs can distance themselves from the horse's belly evermore and ever longer and over time the rider's heels can stay turned away from the horse for ever longer time spans. The latter leads to a turning away of the calves' muscles and to an even easier advancing of the horse (a turning of the calves' muscle towards the horse's belly now occurs only for very short times, when necessary). Pulling up slightly the rider's heels additionally leads to a stiffening of his ankle- and knee-joints and through that to a constant distance from his balls of foot to his buttocks (the rider is standing a tiny bit in the stirrups, comaparably to "sitting" on a swivel stool). By this a bumping into the saddle is avoided and in trot and canter a constantly comfortable seat is achieved, regardless of possibly stiff horse-gaits or possibly steep fetlock joints. A "wiping out" of the saddle doesn`t occur anymore and the rider always sits on the very same place in/on the saddle. The suspension in the rider is located now evenly in his minimally giving ankle-, knee- and hip-joints and spine-column. Meanwhile the similarities between the Gueriniere-seat, with it's supinated hands, and the Lotos-Seat in Yoga become apparent: The Lotos-Seat produces the best possible posture of the human spine-column for sitting for an extremely long time: The (here nearly maximal) supination of the hands leads to a retraction of the shoulders, an opening of the thorax to the front and through this to a physiologically correct position of the thoracic spine-column (kyphosis). The now correctly upright standing lumbar and thoracic parts of the spine column allow the neck spine column the best position and so for the head to be held fatigue-free with an elevated chin. Before my mostly pronated hands had led to a pulling-forward of my shoulders with a tightening of my chest, which produced an unphysiological kink of the throracic spine-column, a "bump" (hyperkyphosis), much like the undesired "false kink" in a horse's neck, and stopped here the swinging-through of my spine's movements: no wonder, that my head often wandered downwards: it didn't have a proper support by the badly placed spine column! My stance became a falling forward of my upper body, producing more weight on the forehand. Additionally this spine-column stance led to a tilting backwards of my pelvis, producing an unintended collection of the horse with a shortening of the stride of the hind-legs. 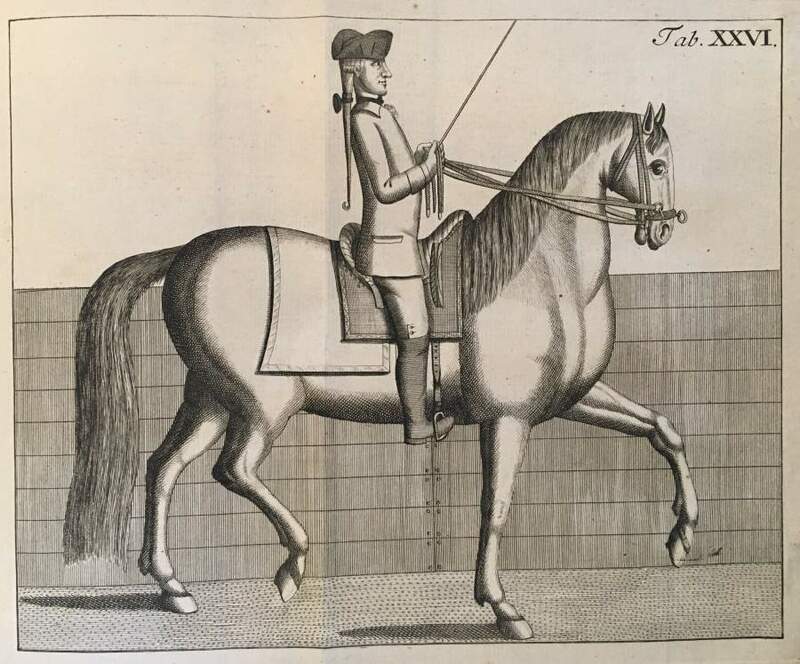 The Gueriniere-seat produces the opposite: through the slight supination of the rein-fist and the mostly even more supinated switch-hand the rider's shoulders retract, opening his chest and putting upright in a physiological way every part of the spine-column: one can hold his head upright fatigue-freely! The pelvis is put upright in a neutral way, producing neither collection nor advancing. Advancing now in big strides: after many years of stumbling around on the forehand, evry week now there is pronounced advancement: if Paco has seemed to be reluctant to move forward and had to be driven forward with my constantly tapping legs, now he and Picasso nearly always move forwards much more easily and in fresher tempo, only occasionally a slight use of the switch is necessary, when the Pinky-Push should not suffice. (Because of this retracting seat Picasso notably had developed the habit to start every canter in sort of a Demi-Courbette, from which I always had to push him forward into a proper field-canter!). Now everything learned in the past is easily integrated and, for me also unbelievable: I'm able now to canter Paco on a saddle-pad without stirrups or reins, only with switch-steering and supinated hands in the riding arena and on a circle canter calmly and evenly (hands-free, you could call it)! For 10 days now I'm riding without spurs (for the first time ince 10 years!) and only now I notice, how much their use influenced negatively the rythm and the flowing movement of the horse. To test the instruction of Eisenberg for reaching a shoulder-in now I've added a cavecon to the curb again. Eisenberg pulls the inside Cavecon-rein (with loose hanging curb-reins) and by this brings the horse's head to the inside, then he pushes the inside rein to the outside of the withers (this way producing a "around itself bending rein"). If necessary, he uses the outside rein as a "from itself pushing away-rein", shoving neck and shoulders of the horse to the inside, if the seat aides alone are not sufficient. With supinated hands all this is astonishingly easy and precise to accomplish! With 1:3 or 3:1 leading of the reins now the problem occurs that one has to decide: either to use the switch along the outside of the horse's neck, which makes the cavecon-rein on this side useless, or to use ths rein, which impairs the use of the switch. The solution of this problem can be the use of the 0:4 or the 4:0 leading of the reins: with this the shoulder-in after Eisenberg is possible, too, and now the switch is fully operative additionally. For straightening the horse in riding straight forwards cross-country a wonderfully supporting lesson! In the rein-leading 1:3 or 3:1 it was recommended always to lead the single rein of the switch hand between 4.and 5. finger. Today it has occured to me, that this effects a retraction of the rider's belly, exactly the opposite of the desired result of the pinky-push! If you want to avoid this, you must let the single rein run around the 5.finger, too! ( I have mused for a while why in english-riding (with its mostly recommended holding upright of the rein-fists) no one ever had found out about the pinky-push: now we have the answer!). The pinky push of the rein-hand also gets more difficult with 3 reins in hand: now one has to push forward pronouncedly the 4th finger, too, for a good effect. If you hold the switch (Fleck Dressage-Switch) like I always did before, holding the lower olive within the fist, the Pinky-Push is severely impaired: one has to hold the switch at the shaft between the two olives. Also holding the thumb pressed against the switch's shaft is contraproductive in the same degree: you may lay your thumb only on top of the cavecon-rein! Result: The switch wobbles a bit more in your hand, as you hold it like you would a bunch of flowers, but the advancing by applying the Pinky-Push now equally with both hands makes it more equal and more effective (although the switch approaches the rider's middle of his forehead somewhat more!). The strongest, you could say the "Pinky Push Maximus" is used by his rider to effect the capriole of Pompeux. (Regrettably I'm still not advanced enough, to test it myself!). So there probably is more than only a little bit of truth to Bent's assumption, that the danish horses of that time to no small part have been desired so much in all the world, because their riders could present them with this extraordinary brilliance! Even Pluvinel held his switch nearly always in the "Bouqet-Grip" (as one would hold a bunch of flowers). The opposite, the "Rod-Fisher's Grip" (thumb standing upright against the rod's shaft to stabilize the throwing-out of the fishing-line) we riders often use, too, for stabilizing the switch in our hand. As I found out on Okt. 26. the rod fisher's grip blocks the Pinky Push massively. Today I noticed that one can increase the force of the Pinky Push considerably by righting up the thumb behind the switch and pressing the thumb against the switch (towards the rider) from behind! After that I tried again the rod fisher's grip and found out, that pressing the thumb now against the switch to the front (away from the rider), tilts the rider's pelvis back (supporting collection). So the Rosenborg depiction of the stallion Recompence suggests an initiation of collection in this moment, possibly starting a walk-passage. Also the levade of the stallion Mars is supported bis the rod-fisher's grip. No wonder, that Paco in the beginning of canter always elvated himself Demi-Courbett-like (once he even jumped a Vienna-style courbette with me) and Picasso, too, always started a canter with a Demi-Courbette: Not only had I been sittting heavily on the forehand by my pronated hands, I even pressed my thumb forcefully to the switch in the rod-fisher's grip! Depicting the rod-fisher's grip in the "Royal Danois": Svan, Mars, Imperator, Tyrk, Recompence. carpi: belonging to the hand. To fully understand the possible movements in the information of the IPhone-App one has to undertand the Neutral-Zero-Method (engl.Range of motion (or ROM)). The Neutral-Zero-Method is used internationally to document impairments of joint moveability and describe them in degrees; the name refers to the reference model in which every joint has 0°. Every deviation is noticed in plus- oder minus-degree numbers. If you look at the wikipedia picture, you will notice that the hands are depicted in full supination, despite the normal position is "along the trouser's seam". This unnatural reference-position is necessary to give the carpal-joint-movements an abduction and adduction. (For the upright standing fist in the Gueriniere-Seat (basic position) the correct NN-description would be "-90° supination" or, seen from the other side, "+90° pronation"). For us it it is much better to refer not to the NN-Refernce position, but to the normal position, which is the upright standing fist, from which a pronation of max. 90° to one side and a supination of max. 90° to the other sides are possibble, thus eliminating the use of minus degrees.. Example 1, rein-leading one-handed left: in riding a straight Straight without accelerating (rider's pelvis in mid-posture) the (left) rein-fist will be held in a supination of 10°, the (right) switch-hand in a supination of, say, 50°. Example 2, rein-leading one-handed left: for advancing while riding a straight Straight with Pinky Push (rider's pelvis in forward tilt) both hands have to be held in 0° . Example 3, rein-leading one-handed left: for turning the horse to the left, the rein-fist will attain for a few seconds a pronation of 80°. At the moment I suspect the following relationships: the Pinky-Push is started by a radial kinking in the carpal joint (abduction of the hand) through the tightening of the radial hand-bending muscle and the radial hand-extension muscle (musculus flexor carpi radialis und musculus extensor carpi radialis). The desired masive conduction is reched by a strong tightening of their opponents: the ulnar hand-bending muscle and the ulnar hand-extension muscle (musculus flexor carpi ulnaris und musculus extensor carpi ulnaris). Through this reflectively a tensioning of the long head of the Triceps-muscle (M.triceps brachii) occurs, which leads to a forward-downward movement of the lower rim of the shoulderblade, which pushes ribcage and thoracic spine to the front. The result is a flattening of the thoracic-spine's curve (>hypokyphosis), this in turn to a prounouncing of the rider's lumbar curve ( >hyperlordosis). This movement effects a tilting forward of the rider's pelvis which leads to an advancing of the horse. After successfully testing Eisenberg's way of inducing a shoulder-in and including it sometimes in my aids repertoire, I tried next his way of croupe-in with an 80° angle to the wall: disappointingly this was not possible in a soft way and I had to give up this stressful project after 2 days. Reading up afterwards in Gueriniere's text, I found his sharp rebuke of this method, criticizing hereby also very good riders as Pluvinel, Newcastle(S.234), Eisenberg (S.38) and Ridinger! So even for these grandes of the art of riding sometimes we have to realize: "Nobody is perfect!". (See also Branderup/Kern p.73 [where this critique is interpreted only regarding the counter-shoulder-in = shoulder-out]). I was lucky, that I (in reality more my horses) had recognized very early on, how dangerous and harmful this lesson might become! Since then I'm using mostly the croupe-out and have begun to use Gueriniere's much stronger "croupe-au-mure", which he calls a leg-yielding with the horses's head bent into the direction of movement, with an 80° angle to the wall. In the longer, younger Picasso this is produced more or less easily, but with the older, shorter, strong backed Paco it's considerably harder to achieve and maintain! This "angle to the wall we are moving along" could also be expressed as "the angle to the wall we are moving towards", which is 10°. This 10°-angle appears everywhere with Guerieniere: he uses it in the Traversale, in the Karree, the Demi-Volte and the Pirouette, too. The most important sign for a successful, healthy croup-au-mure, besides the maintaining of the ever steady angle to the wall, is a beautiful arc of the outer front leg over the inner one, as this shows it is not on the shoulders. Under no circumstances the inner front-leg should be permitted executing a wide, spectacular lunge step, as this brings the horse onto its shoulders and additionally often leads to a falling out of the hind, and thus to a falling apart of the horse. By this all the three most important goals of this lesson are missed: The higher erection of the forehand, the increased treading under of the hind legs and the preparation for a canter sideways in the same posture and angle. After only 10 times I got the impression of a real improvement of the shoulder's lightness. Croupe-in along the wall I'm using only rarely now, and if, only with a distance of at least 1.5m to the wall, as de la Broue and Gueriniere just find acceptable (and only for exceptional horses). If the rider carries the Fleck Dressur Switch between the olives, a far too long protrusion of its end results; Gueriniere recommends the vanishing of the switch's end within the fist anyway. After changing to a natural switch today I noticed a possible blocking of the Pinky Push, which occurs when the switch ends centrally in the palm. If one wants to use the Pinky Push, the switch's end has to rest on the ball of the little finger! "pushing the belly a bit forwards to avoid a vaulting of the shoulders" ("L'estomac un peu avancé pour ne paroistre avoir les epaules voultees"). Meanwhile it's become clear to me, that the reason for supinating the switch hand is not only to let the rider's belly come forward a little: a profit occurs also through the neutralisation of the switch hand's thumb despite it is lying upright at the switches shaft,same as in the rod-fisher's grip: as in a supinated hand it can only press sideways, which doesn't have any effect on the position of the rider's belly. So nothing happens, if the rider gets rigid and presses his thumb against the switch! The older people get, the more often a rounded back occurs. This means a hyperkyphosis (a rounded hump) of the upper part of the thoracic spine has formed . This spine deformation leads to a bending forward of the shoulders which are permanently rolled in and held forward, and thus producing more or less fixedly pulled up shoulder blades. In this case the pinky-push doesn't come through or if, then only in a diminished way: so the rider must try actively to push his belly forward for tilting his pelvis forward, if he wants to accelerate his horse. Additionally he can hold his upper body somewhat backwards, to minimize somewhat the falling forward tendency of his head. Holding his legs „before the horse“ seems to be equally important, too. Though supinating his hands in this case doesn't bring a maximal effect, too, nevertheless a little and palpable effect occurs. Every human constantly has to take care of his body posture and to correct himself at least 50 times a day: in sitting, walking, lying, at the desk, at the computer (vertical-mouse), driving a car,etc. The German chancellor knows this, too: her Merkel-rhombus doesn't only give her a good standing, but is a little therapy, too. There are many websites showing very good exercises of Yoga, physiotherapy and breathing techniques to be found on the net. As two thirds of the patients don't feel pain through many year's, the suffering is not great: maybe the wish for a good rider's seat might here work like a forehand-erecting curb? Not only the nearly maximal supination of the switch-hand is neutralizing the pressing-thumb: the same importance has a strong extension of the index-finger along the switch-shaft : So I assume that the extensor- or the flexing-tendon of the index finger blocks the upper-arm muscle, which pulls the lower rim of the shoulder-blade backward (leading to a tilting back of the rider's pelvis). Knowing this, the rider gets an exquisite additional incentive to observe the correct holding of the hand. In my case the croupe-au-mure to the left in the left-hander seat is especially hard: as most will do, I trained the Gueriniere-seat first in the right-hander seat, and only after some months in the left-hander seat, too, so the latter always remains a little weaker. On top of that, Picasso's worse bending side is his left. So here my seat is falling apart most easily and I get rigid which often causes the horse to go backwards in the croupe-au-mure. Here a pressing-thumb would disturb massively! Noticing this now, I will put the switch-hand so low that the experimentally sideways pressing of the thumb to the switch creates not the slightest muscle-tensioning in my back: then I will be able to correct the horse significantly better: a palpable lightening occurs! Holding the switch-hand (now left) a fist's height lower and hooking in the left curb-rein to the little finger it acts now with a previously unknown lightness and precision and I'm able to lead this rein in the same easy, slightly hanging-through way as in riding one-handedly. The same applies to the training of the 80°-sideways (see my commentary to Saunier on Fundstücke/Finds) on the carree on one hoof-beat at the turnarounds on the haunches in the corners, or at the demi-volte in the carree (volte inside the volte). Update 02.03.17: New terms necessary! If the rider uses a non-symmetrical seat and also intermittently wants to change the way of seating , the terms "right" and "left" loose their definite meaning, at least if one doesn't want always have to add: "in the left-hander seat" or "in the right-hander seat". for the type of bending: "bent to the switch-hand" (with the switch held crosswise over the mane) / "bent to the rein-hand", also: "bent away from the switch-hand", both with the switch parallel to the horse's neck. Is the horse bent to the switch-side, the switch-hand always is kept lower then the rein-hand, to be able to grab the rein with the little finger should the need occur. Is the horse bent to the rein-hand, the rein-hand is the one kept lower. While riding a straight Straight without any bending, both hands are kept on the same height, near to each other. My initial goal of always holding theright arm lower has not proved to be good: though in the switch-hand bending it helps much, in the rein-hand bending and in riding straight it is a hindrance for horse and rider: and so in the latter cases the hand tends to move upwards anyway. But for my researching the impact of supination, it was an invaluable tool for teaching myself! The goal: Hands never in pronation has proved to be very effective, though I soon had to concede to one exception: if you want to turn the horse to the rein-side, you have to pronate the rein-hand to 90°, so that the thumb points to the outside. The goal “The thumb always points straight ahead” has proved very valuable,too( a small deviation of ar. 20° tin the direction of the switch-hand seems not to harm its effect). The third column of my Gueriniere-Seat should be the always held forwards legs. This was very difficult at the beginning, but got, after polishing the use of the Pinky-Push, easier and easier. The terming: “Legs at most times held before the horse”, having been a mis-translation originally during my agonizingly slow word-by-word translation of Broue's, I will keep it unchanged nevertheless, as it very clearly expresses my seat-feeling. By this position of my legs the effect of my seat and my body-posture have improved considerably. Since finding out the effect of the pressing-thumb, I have worked for a long time mainly on preventing the unintended collection by it. With stretching the forefinger along the switch-shaft this gets fairly easy now and in the last days I have even begun to apply it again sometimes. Through my work in the Croupe-au-mure I became suspicious of his many depictions with a so-called "protruding lower-neck". Up to today I had believed this to be a sure sign of a pushed-down back of the horse. We all know the pictures of horses with highly elevated forelegs and a dragging hind, the latter causing a tilting upwards of the horse's pelvis and with this a shoving back-out of the hind-legs, a lengthening of the horse producing a pushed-down back and kissing spines. 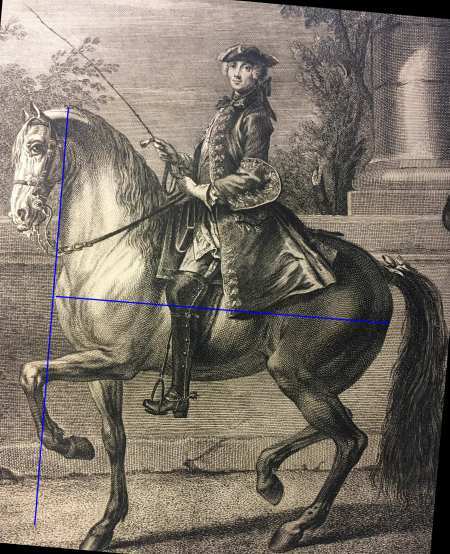 Only: with Gueriniere to the contrary the hindlegs are pushed forwards under the horse, the pelvis tilts down and so a vaulted-upwards back is produced: by this no pushed-down back should be able to occur! Here the ocurring visibility of the lower neck by taking backwards the upper neck with the horse's head means that the forehand is maximally erected, and the weight of the forehand is pushed to the hindlegs as much as possible: the forehand becomes free (of weight) and by this can move much more freely! 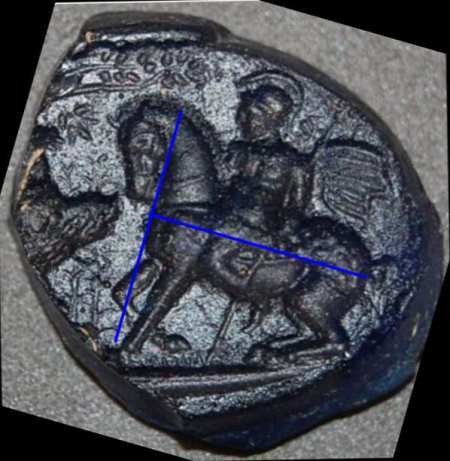 Seen in this light the depictions on my Finds-Page, it becomes clear that a slightly visible lower neck was proudly shown on the best horses of their times. During the last week my horses have corrected me by actually showing a sinking of their back as a result of a too far retracted neck and head: so I have to shrink the usefulness of my gradient of collection to a much shorter range. Should I find a suitable PC Software showing the weight on each hoof and processing my gradient of collection in real-time, I hope to find out the exact borders of "Anti-Collection" (with shoving back of the hindlegs and the striving away of forelegs and hindlegs from each other, on one hand, and on the other the exact point of pushing back the upper-neck of the horse too far. Until then I can rely only of the feeling in my seat again, hopefully telling me in time if one or the other occurs. 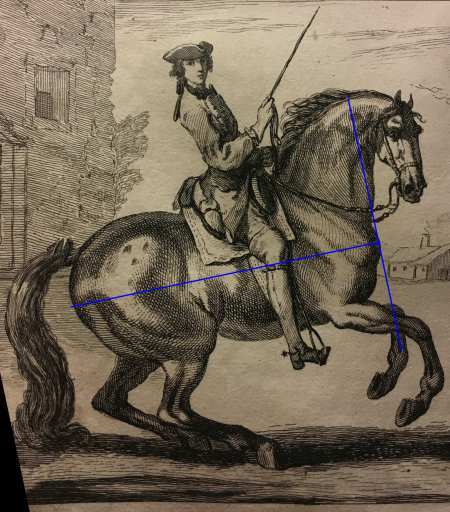 My impression is, that the old masters took back the upper neck only to the line perpendicular to the axis of the horse's body, and thought only of more than this as harmful. So a visible lower neck should be judged a mistake only, if the upper neck is retracted behind this perpendicular line. The definition of this Angle of Up-Straightness then would be: Angle of the frontal rim of the neck to the body's longitudinal axis. In the sketch by Pablo Picasso a pushed down back is produced through "Anti-Collection", wherein fore- and hindlegs are striving apart: a sinking back is the result, with a much reduced bearing-ability. With the Lecomte Hippolyt and in the east-indian school-halt we can see the second type of mistake in collection: the upper neck is retracted too much. 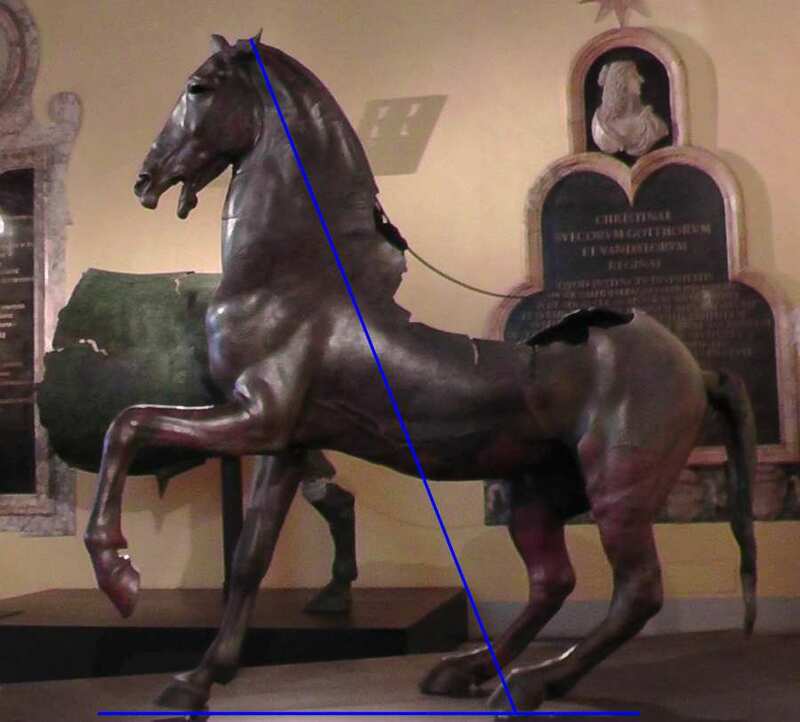 The angle of Up-Straightness alone doesn't say everything about the degree of collection, we have to include the effect of increased load-bearing of the hind-legs, too. 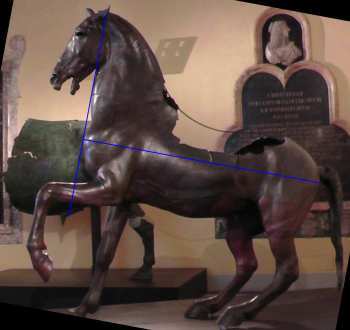 In the standing, highly collected horse we can see very well, and even measure to a little extent, what is most important to La Broue,Newcastle, Gueriniere and Saunier; from this I have developed my “Gradient of Collection”: If we draw a straight line from the highest point of the horse's neck (the atlantoaxial joint) to the farthest back standing leg (which is bearing the highest load), this line is the steeper, the nearer these points are to each other. This gradient (= steepness or tilting angle) is variant due the different shapes of horses: the type of frame, the length and form of the neck, the degree and way of the bending of the haunches, but also due to the lesson: School-Halt or Courbette (Levade) in standing, Piaffe, Walk-Passage, Trot-Passage etc. in movement, and is only applicable if a.) there is no anti-collection and b.) the angle of Up-Straightness doesn't exceed 90°. In the School-Halt we can see very well how the freeing of the shoulders (of weight) increases with the steepness of the gradient of collection: in the bent School-Halt at first only one shoulder gets completely free of weight and lifts up first, and only when the complete weight of the horse is fully on the hind-legs, the second foreleg lifts up, too. Measured Values: Most of the horses on my Finds-Page are standing in the square type, so in the following I won't indicate the type of frame. All values can only be approximations, as many horses are depicted somewhat obliquely! Broue,Newcastle, Gueriniere and Saunier use a high angle of Up-Straightness and a steep gradient of collection for many lessons: in the shoulder-in, croupe-au-mure, the Traversale in Pasege (and Passage?) and in the Demi-Volte and Pirouette. Maybe one day we will find out that a definite gradient of collection is the best one for the fatigue-free skipping in courbettes ? Ideal Courbette to the right with Gueriniere. 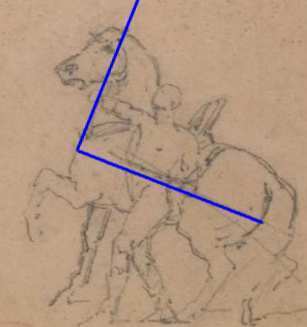 Yesterday I found in La Broue's "Cavalerice" that it is necessary for a good 80°-sideways movement, to not bend body and neck of the horse! Now this cleared up Saunier's words regarding the holding lower of the inside hand: by this he achieves positioning the horse's head without executing an "around-itself-bending inside rein"! Gueriniere, too, writes that body and shoulders have to be straight in the 80°-sideways movement! 1. He puts the switch-hand lower, to minimize the effect of the inside rein on the horse's neck, to prevent a neck-bending (with the inside rein of the snafflecurb) while positioning the head to the side he is moving to. 2. He supinates the hand to achieve an upright and free rider's- seat. 3.He extends his index-finger along the switch-shaft to avoid using a pressing-thumb inadvertently. Having trained the 80°-sideways-walk over four months now in the Croupe-au-mure (for which Gueriniere demands, to put the horse's outside shoulder onto one line with its inside hip), the Renvers-Karree (with ¼ pirouettes on the forehand in the corners) and the normal Karree (with the croupe to the centre and ¼ pirouettes on the hindlegs in the corners) and after some tries to hold this angle in the sideways-canter in the field, I've succeeded today for the first time in closing the Demi-Volte, which I had started in the Sideways-Walk, by two jumps of Terre-a-Terre while performing a Trot-Passade. Broue calls this sideways-canter at the end of a Demi-Volte „Terre-a-Terre“; (see Vol. 2, p.43). Also about the Sideways-Walk, that when the forelegs are crossing over, the forehand gets narrow and at the same time the hind gets large, as the inner hindleg moves to the side. At the next movement, when the hindlegs are crossing over, the hind gets narrow and the forehand large, as the inner fore-leg moves to the side. So in the Sideways-Walk the horse is always in half a Terre-a-Terre: the Terre-a-Terre of the hindlegs, when thess are large, and in the next moment in the Terre-a-Terre of the forehand, when the latter is large. Wanting to ride a traversale in walk yesterday, my horse took it for granted to start going sideways: I was very astonished! But no wonder, after all this months of work in the Sideways-Walk! So I had to tell him explicitly how much forward I wanted him to produce. At this point it became clear to me how wrong I had been over all the years in my thinking about producing a traversale in working-trot. Very difficult is to rethink the traversale from the space-expansive (on the forehand) one used today, to a slow Walk-Passage-traversale with erecting the forehand highly! When Gueriniere at the changement through the manege on two hoof-beats speaks about Broue saying, that the rider needs to be very careful in supporting the crossing outer foreleg in a certain moment, I'm reminded now of the way, I'm trying to support my horse during the 80°-sideways. At the moment I prefer to execute a steep, but shorter sideways-walk-traversale, as I'm still much to impatient for a long and slow changement. To passege in walk means that the horse elevates his foreleg and hindleg as in the trot, but not in the exactly very moment as in the trot, merely with a not perceivable pause before moving the other leg; the horse lifts the forelegs higher than the hindlegs, and when the horse lifts the legs equally high on both sides, it is called a Passegio, which, despite not being as gracefully as in the trot, is majestic nevertheless and appropriate for a prince." So the walk-passage straight-forwards was a dignified, calm way to present themselves for noble and powerful persons, too. When riding his horse on one hoof-beat (straight-ahead) on a carree in a very calm, regular, cadenced trot-movement, which at least is approaching a floating-trot, one has to execute a half-halt before the corner, and then turn his horse in the now even more shortened trot, which approaches a piaffe. This 1/4-Pirouette in the Piaffe is a turning on the middle-hand. Three Sideways-Terre-a-Terre jumps to the left and, only by laying over the switch to the other side of the horse, changing direction and riding, without break, sideways another three jumps to the right, and then, also without break, forwards in a beautiful carriere and on into a fast gallop for five jumps! The Carriere over many years has been a coveted goal for me, but with my pronated hands, my rolled-in shoulders and my head hanging forwards, I always put my horse on the forehand, which always resulted in a "high-start" into the courbette, which I had to push into a proper canter (never realizing that this reaction was not a rearing and not a holding back of power by the horse). The trot-passade I start at the moment with a fresh trot along the long side of the arena for about 5 horse lengths, stopping this through a strong halt (achieved only by seat, upper-thighs, voice and barely a pull at the curb-reins) and riding, without letting stand the horse, immediately the angular demi-volte in the 80°-travers-walk, to start in the fresh trot again at reaching the wall again. Having achieved some nice Terre-a-Terre jumps at the hand some days ago, Paco today, after an accidently triggered Terre-a-Terre jump backwards during the Croupe-au-mure at the hand, let himself stopped during the next one so far, that he had only set his hindlegs far under his belly, but didn't let his forelegs leave the ground: so he stood in a posture with a very much lowered croupe, and succeded even in taking 2 steps sideways in this posture; maybe this will be my way to achieve a good gradient of collection during the sideways? 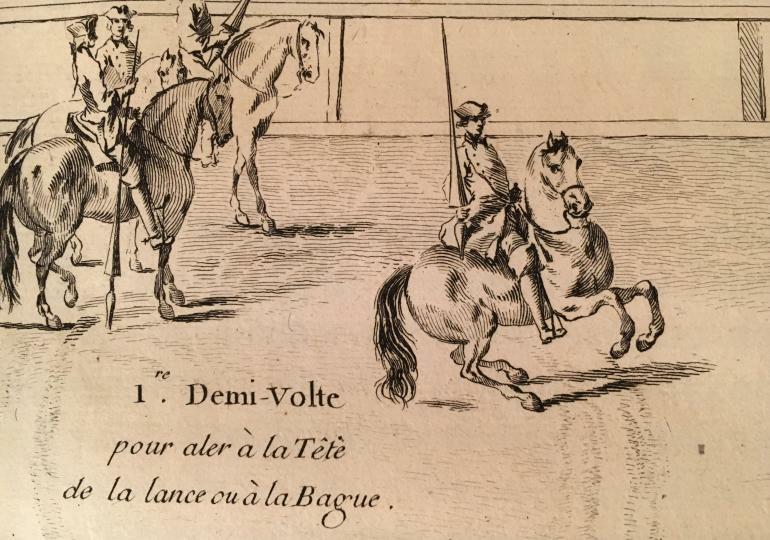 My training program (in the arena) always starts with a school-halt at the hand, continuing à la Gueriniere (though at first in handwork): shoulder-in (35°) in walk on both hands, then croupe-au-mure (80°) in walk on both hands, then mounting the horse and in a fresh trot straithening him on the middle line through the length of the arena, then from the saddle shoulder-in and croupe-au-mure in walk again. For the 80°-sideways I place the switch same as in the woodcut in the Sébillet: obliquely forwards down before the inner shoulder (at the ground I lead the horse from the outside). Meanwhile is has become clear to me, that in the Gueriniere-seat I don't only have my legs before the horse (sometimes only a little bit, but always palpable! ), but also my belly, and, because my upper body is not tilted foward anymore, this part also is carried before the horse's movement: the rider feels carried like a ship before the wind! Now I call it: The rider is sitting before the horse. Looking back now my old seat had the feel of pushing a wheel-barrow: the rider's legs and belly behind, the upper body fowards und the rider's head forward down. 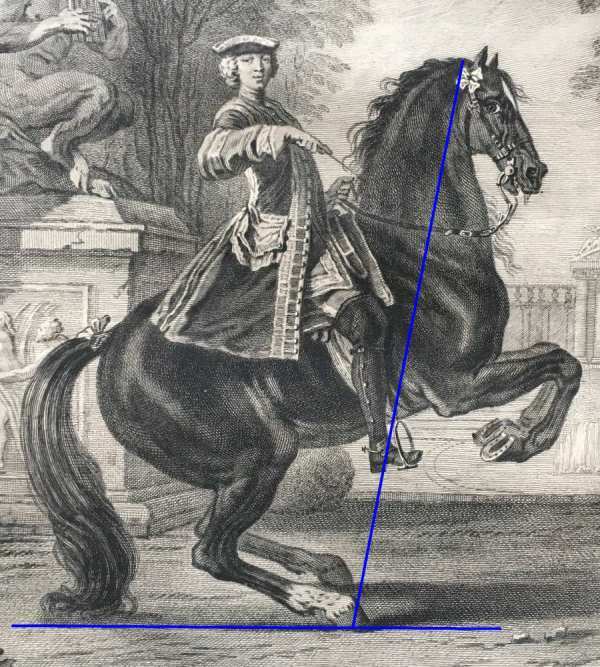 Whilst researching the pulling-up of the rider's heels, another important benefit of the "legs before the horse" became clear to me: testing, after many months, once more the wrong pulling up of the heels during the "legs behind the horse" I got reminded, that the rider sometimes gets hit against the front part/the gallery of the saddle; long had I forgotten this uncomfortable side effect of the customary seat! After the last supervisory lesson by Marius it became clearer to me that Guerinieres invention of the term „Croupe-au-mure“ is wonderfully suited to prevent riding the sideways with the head to the wall, but as the wall is very long, the rider tends to do it far too long far too early. Better might be de la Broue's approach: at first only one or two paces sideways, still combined with a little forwards, then four or five paces straight forwards, increasing this only incrementally over weeks. Because this training starts traversale-like, it is easier to think (as in a traversale we are always supposed to do) of the desired 80°-angle to the wall along which one moves along (here the short side of the riding arena) as a 10°-angle to the wall the horse is moving towards (here the right side). During my holidays I had ample time to think about Nestier's school-halt in it's wonderful easy manner and to analyze the aids he is giving. He uses the Gueriniere-seat: the rein-hand standing upright with the thumb pointing forwards (assumingly the hand is supinated slightly ab. 10°); the switch ends within the rider's palm. The rider holds his legs before the horse. To produce the school-halt he pulls his shoulder-blades even more together and more downwards, by this the rider's breastbone advances forwards significantly; the horse's mid-back is somewhat relieved by slightly raising the rider's heels and, additionally,the upper thorax of the horse gets unburdened by a stirrup-tread on both sides because now the rider's thighs gets wider. He exerts a slight pinky-pull with the rein-hand which leads to a backwards tilt of the rider's pelvis. So the rider's back comes to be a mirror of the horse's back: Erection of the forehand coupled with a tilted pelvis. 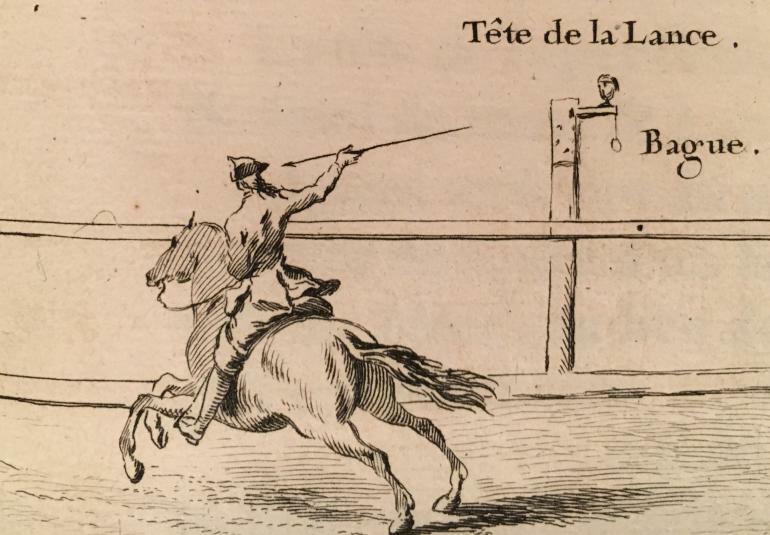 In this picture he presents a special, very complicated situation for the support of the right-bending in a not very far educated horse: leading the right curb-rein with the right hand in a lower position, just as Gueriniere described 20 years earlier in his “Ecole de cavalerie”. (A rider with only some years of academic training better should use the left-hander seat if having problems with the right-bending!). The curb with a very short lower branch makes the rein-action even more difficult, as with this even a small rein-displacement leads to an impact. Deviating from Gueriniere's depictions he holds the switch downwards (in the ski-stick position) and leads the right curb-rein between ring- and middle finger. The switch lies fast at the right thigh, to prevent as much pronation of the switch hand as possible and to give the hand as much freedom of movement over the switch's end. Holding the hand this way makes the right-bending even more difficult to achieve, as the rider cannot try inducing the horse to it by laying the switch parallel to the left side of the horse's neck. The rope, which serves as a second pair of reins is not used at the moment; its inserting point is too high for a normal bridoon: if it is a nowadays unknown bridling stays unclear still. The chainette at the ends of the lower branches indicate a snafflecurb. Holding the switch in the upright fist in the semi-bouquet grasp (the end of the switch vanishes completely within the upright standing fist) with a foward tilt of the switches tip of only 10°, while supporting it on the basic phalanx of the little finger, one can by bending and hyperextension in the carpal joint induce finely calibrated a bending of the horse. At the start, to sensitize his body and that of the horse, one begins with the strongest bending and extending in the carpal joint: for bending the horse to the switch-hand side one uses a hyper-extension and holds the switch-hand behind the rein-hand. For example, to get a shoulder-in to the right, being in the right-hander seat, the fist is rotated so far out that a maximum of hyperextension results: the knuckles (MCP-joints) of the switch-fist point as far to the right as possible, the switch-hand stands farther back than the rein-hand, and the rider allows his left thigh to press a little more against the left forward part of the saddle. With this the left shoulder comes a little forward. Wishing to change into a right croupe-in, the rider simply needs to take his left shoulder a little back and lift the left thigh somewhat from the left side of the saddle, which leads to a turning of the horse under him into the croupe-in. For the bending to the left (the rein-hand side) he shoves the switch-fist farther forward than the rein-fist, turns it from hyper-extension into a strong bending, so that the knuckles of the switch-fist now point to the left side, and allows again additionally a little more pressing of the right thigh against the forward part of the saddle for the shoulder-in; for the croup-in to the left he again turns the horse under himself. Also a very smooth change from shoulder-in right to croupe-in left is finely possible . Naturally the same applies for the left-hander seat, inversely. After achieving the feeling for this aid, and some routine, you will recognize that for the most time there will be no need for a strong rotation in the switch-hand's carpal joint, which can even be far too strong during canter, where the horse can easily feel overstarined by this light aid and begins to throw his head oder actually stops the canter! Here one is learning speedily, how little is needed to hold the horse in shoulder-in or croupe-in while cantering! A straight Straight between these aids, exerted minimally, is achievable more easily! Having translated the Chapter 33, Vol. II accurately now, in preparation for my La Broue book, I'm training the full halt from a lively gait after his fashion: but customized in the way, that I use the school halt instead of going backwards (as the horse is not able or willing to decide reliably which one I want, and will prefer to go backwards, because this is much easier). I would never have expected, that this heavy type of halt would leave the horse so calm: but the 4-5 steps in a very collected walk , which thanks to the sideways training gets more and more unhurried and relaxed, and the 2-3 turns afterwards are pacifying the horse completely, and nevertheless it shoots forwards promptly in the next try. Already this lesson seems to improve all the other lessons, as he wrote, and the horses get more assured and courageous every time. „To form the full halt with grace, the horse must bend its haunches, it shall not traverse and not press against the hand, it shall hold its head still, the neckline high and before the rider. With young horses one is not allowed to make the full halt too short or to suddenly, so as not to ruin his hocks or his mouth. At the inducing the rider has to approach his calves to the horse to animate it, he brings his body back, brings the hands with the cavesson and the reins higher, and after that extends his knees vigorously and steps into the stirrups and at the same time lowers the switch ." 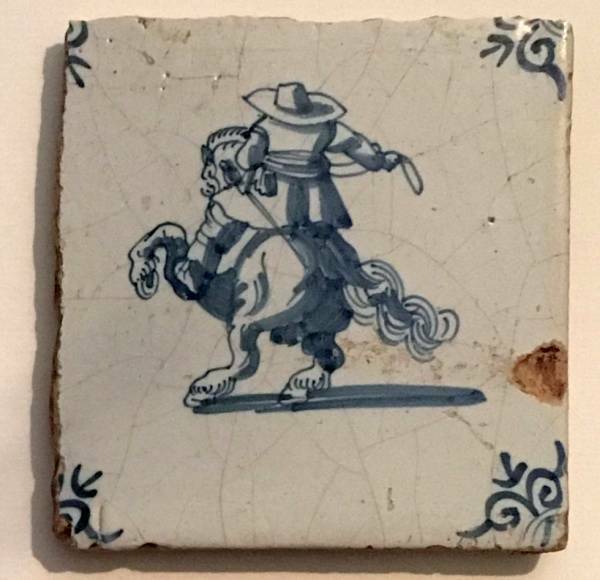 During the translation of Chapter I-34, immediately I thought of this picture from Delft: this rider might have been influenced by the Cavalerice, holding the hind legs of his horse wide apart. 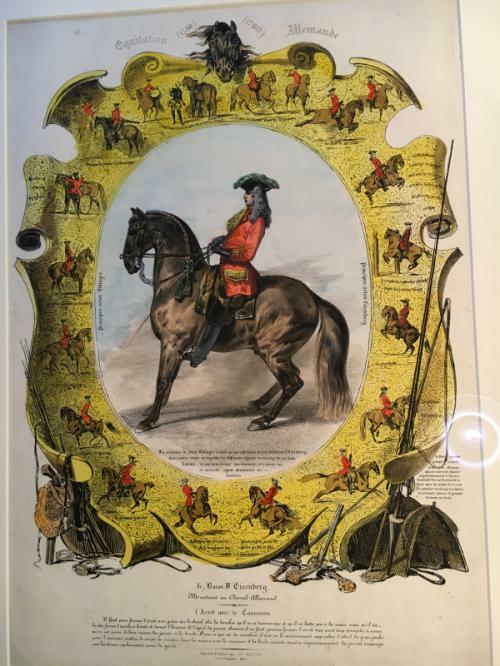 The art-rider's seat I had named after Gueriniere, because I found in his book very clear pictures which regrettably cannot be found in Grisone's and La Broue's; because I feel Pluvinel's seat not correct and Newcastle's to far in front of the saddle. The expression "Legs before the horse" fell into my lap by a translation accident und is used by me nevertheless since then because it hits the mark correctly. If he holds his legs before the horse the rider can feel the power he is treading into the stirrup travelling through the whole length of his legs straight into his complete spine, without losing his seat, not even when he pulls up his heels. The musculus gastrocnemius (the dorsal thick belly of the calf muscle, which while lifting the heel would lead to an additional bending in the knee joint) is then little or complettely not in use. but more or only the flat calf muscle musculus soleus: the rider often gets the feeling of a tightening only of the calf's sides. Are the legs but behind the horse, this line of force will be broken at the rider's knees and then the lower legs become merely appendixes of the knee joints: the rider looses stability significantly in the longitudinal direction of the horse, but also sideways stability, falls forward and often hits the forepart of the saddle unpleasantly: here the dorsal thicker part of the calf muscle, which is used to drive the horse forwards, is tensioned more. A middle postition I couldn't find out yet, it seems there is only before or behind the horse. So my aim is always to as soon as possible return to holding my legs before the horse again after having them put back for a short time, be it out of old habit or for using them more behind as an aid. 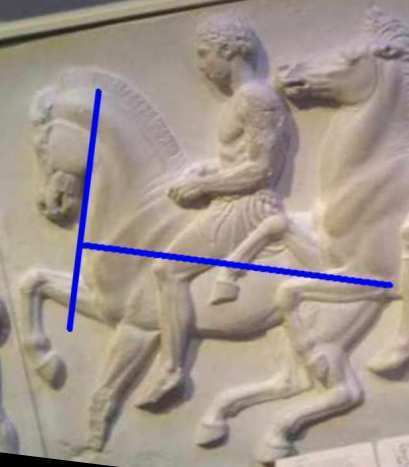 The line of force can also get broken completely through bringing the legs far forwards, as in "legs over the horse" [see Marc Aurel or the mesopotamien school-halt]; here also the lower legs thighs are merely appendixes of the knee, additionally now the feet have no or only very little contact with the stirrup plates. Here no muscle on the calf's back is tensioned. (Riding completely without stirrups, naturally there is no build-up of this line of force possible: one either lets his legs hang downwards straightly or puts them over the horse). Holding the legs before the horse, the rider always treads a little bit into the stirrups and uses a force between 20grams and many kilograms, depending on the need. Here develops a far increased fundament for the rider's equilibrium than that of the englisch seat, one could call it a tripod by bottom and both feet: the rider stands and sits simultaneously like on a one-legged standing-stool. A very important benefit is that the rider can dampen very finely the shocks, which the horse's back gets by the rider's weight, depending on the degree of tension in the flat calf muscle (m.soleus). The distribution of the rider's weight I guess is: ar. 60% on his bottom, 15% each on every thigh and ar. only 1% to 5% on every stirrup plate (except during a stirrup tread). But in the stirrup tread there can arise sometimes a load of ar. 50kg on this plate (as my horse have a wide fundament, the don't sway hereby). Grisone 1550: The rider shall let his lower legs hang down in the way, that they position themselves on their own in the stirrups, as if one would be standing on the ground; the points of the feet turned so, that at turning the horse on the resp. side they point into the same direction as the rider's nose. La Broue 1593: The back straight and firm, the thighs fast at the saddle like glued on. The kness closed and turned more inwards than outwards. The lower legs as near by the horse as necessary, firm and straight, as in standing upright on his legs on the ground, if the rider has a big or medium stature; if he has a small stature he shall, when possible, hold his lower legs forwards adjacent to the horse's shoulders. The heels lower than the points, neither turned inwards nor outwards [means ar. 30° outwards rotated as in normal standing], the soles of the shoes shall lie straight and with safe dependence upon the stirrup plates and so, that the point of the shoes surmount about one thumb's breadth the plate. 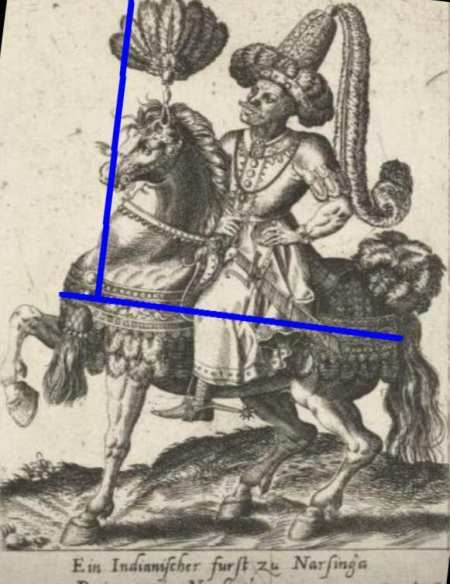 Newcastle (frz.1.Buch) 1657: The rider shall sit in the front of the the saddle as far as possible, letting his legs hang down as if standing on the ground, thighs and knees as glued to the saddle, the legs put firmly into th stirrups, the heels somwhat lower than the points. Looking at the old pictures one realizes that the advice to let hang down his legs straightly can be meant in two different ways: a contemporary show-rider, grown up in the englisch seat, with his legs behind the horse, wants to say: so that still at least a little angle in the knee joint occurs, with tightening of the thick m.gastrocnemius ( = "not treading into the stirrup! 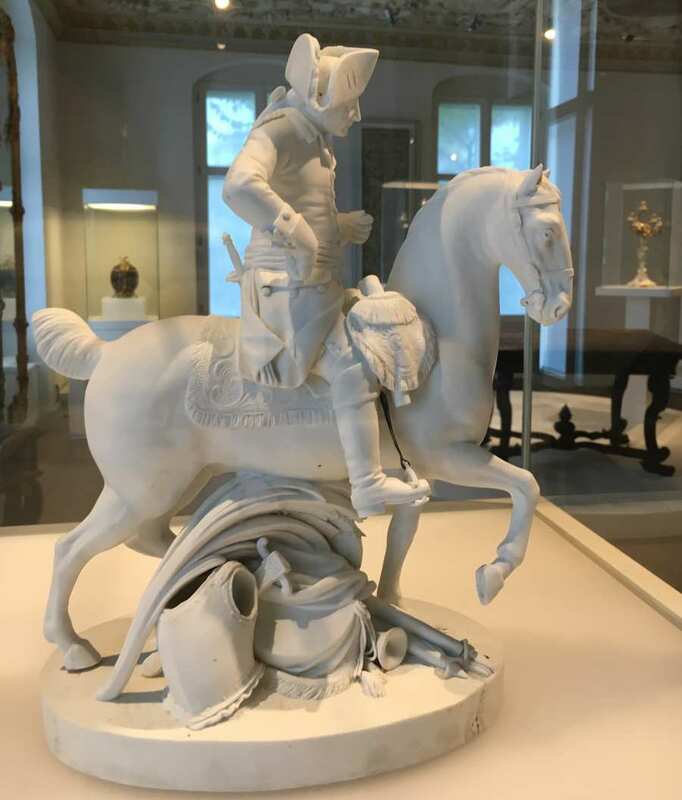 "); and on the other hand the art-rider before 1800, who is holding his legs just a bit before the horse, without an angle in the knee joints, ( = "always at least a minimal tread into the stirrup! "), except for short aides. While holding the legs before the horse at the beginning is quite difficult for the rider to uphold, for the horse it is even harder: during riding english the relaxation of the rider is signalled to the horse by throwing away all pressure in the rider's seat and body, sometimes relaxing the legs by putting them fowards, meaning pause for the horse, but now the real, loose work shall start with exactly these signals! The horse has to adapt greatly, as the rider tries to hold his legs forward as often and as long as possible, by which from him are stolen not only the spurs (Pluvinel) but also the calfs and the heels for driving the horse! Here he must find other means and learn to use them: at first one thinks of the switch, but it alone often will not suffice: he also has to dismiss the sitting on the forehand, which is used in the Englisch-/race-/jump-/hunting seat, in favour of a forehand-unloading seat, which consequently will be a hindquarter-loading seat, which is an important gaol of the academic art of riding, by bringing back his upper body a little, by not pronating his hands, by letting his belly come forwards slighthly, by not rollig in his shoulders, and so on. Additionally he has to allow the horse to step forwards freely by tilting his pelvis forwards (or at least not letting it stay tilted backwards) and, if appropriate, use the pinky-push; and instead of driving the horse by heels/calfs/spurs using a stronger or weaker loading of the stirrup at the time when the horse rotates downwards its ribcage on the same side, to increase the forward stepping of the hindlegs. Increasingly in the lessons known to him and the horse, the clutching of the lower legs behind the horse will vanish, but in a new lesson easily occur again, which is not always to be seen as a mistake, as the horse can agree only to a lesson it understands, and the rider also has to get a feel for the new lesson, which all can be achieved often only by increased driving with the legs. Thes "false" aides can be abandoned or at least reduced in the later training. The horse-scales have been here: Paco's weight combined with mine and saddle is 660kg. Only the forehand on the scales it shows 330kg, the scales is 20cm higher than the surrounding ground where Paco's hindlegs are standing: that means some weight is already shifted to the hind already. We had only very little time and could only use our standard school-halt once: the scales showed then only 240 kg for the forehand: 90kg less on the forehand means 90kg more on the hindlegs = 420/240kg. Described in another way: the forehand was unloaded from normally about 60% to 36% of the weight! So in this medium school-halt the haunches had instead of normally ar. 40% now 64%: a real, slight "arret sur les hanches"! To train once in a while a whole halt on the haunches from the lively trot or from the canter produces actually the effect La Broue predicted: all collecting and higher lessons get much better, from the school halt and the very collected trot onwards! Since having begun very cautiously to test his instructions for the Courbettes, I have begun again, after many years, to levade my horses, which I avoided for a long time out of fear to produce a harmful Pesade: As La Broue describes, we should begin with Levades out of the forward movement. 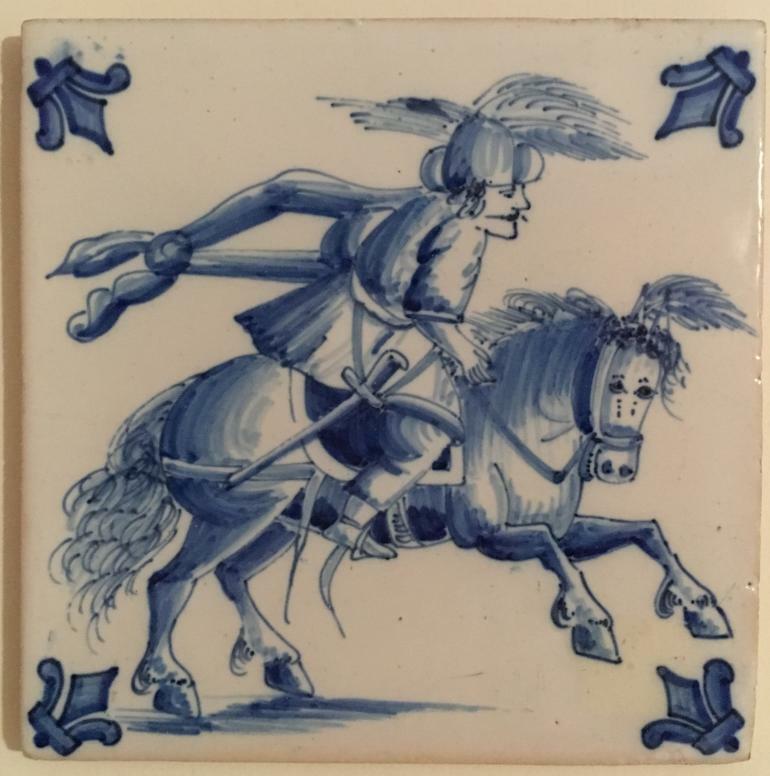 With me, it developed into somewhat else, so at the moment I can elevate the forehand of my horses somewhat during a slow canter uphill at every second leap (my inner picture for this is the tile from Delft of 1650, which may show exactly this movement, and Ridinger's pictures "A strong halt out of the canter" or "The relevated canter"). While doing this, I think of La Broue's comparison with the "Jeu de paulme" and the result is a body stance of the rider similar to the forearm pass in volleyball: the rider's legs then are so far forward and a little bit up, that one has to speak of the "legs above the horse" here, all the more as the rider's knees are bent a little bit, too; additionally the rider's hands come forward, too. On top of that, I reinforce the lifting of the horse's fore-hand by a pronounced pinky-push, and for now I achieve (perceivedly) sometimes a distinct elevating of the forehand. This elevating of the forehand leads to a distribution of much more weight to the hind-legs, which then bear the weight more under and more forward under the horse. At last the Terre-a-Terre straight forwards (=Mezair?) develops further, as the horses now understand better that I want them not to move forwards much. Yesterday on the way back to the stables, where the horses always quicken up a little bit, Picasso offered me of his own volition in this gait in a 45° degree angle to his "good" side, very calm and leger, eight leaps sideways, holding his body and neck straight: probably for avoiding me to get the idea to let him leap sideways on his stiff side, as he doesn't move well to his stiff side when wanting to reach a place fast. Trying afterwards to do this on his stiff, left side, he became very entier, went against the right heel and switch and became on the right side very constrained/tight (= bent the whole body and neck maximally to his right side). So in this gait anew a lot of gymnastication awaits us! The Semi-Boquet grip of the switch-fist (see 01.Nov.17) gets finer more and more: For the swinging out of the horse's hind it's not necessary anymore to put the switchhand before or behind the rein-hand: now I can leave it beside the rein-hand, it works solely by the rotation of the fist in the carpal joint. To swing the horse's hind to the left, I swivel the switch-hand to the left, so that the knuckles of the switch-fist point to the left, to swing the horse's hind to the right, I swivel the switch-fist to the right, so that the knuckles point to the right: the movement is simialr to that of hitting a tambourine against the other hand for sounding it's jingles. Thus I initiate a volte to the left by turning the switch-fist to the left for one to two steps, holding this stance if I want the horse to hold the haunches within the volte. If I want to lead the croupe back onto the circular track, I turn the fist shortly to the right (held longer to the right, a slight renvers occurs). During Canter on circular lines this proves to be very useful: Start with a turn to the inside for one to two canter leaps, then a short turn to the outside for stabilizing the circle-movement, then inside again for a better stepping under of the hindlegs, and so on. It makes a very good support in the 80°-sideways, too: sideways to the left: knuckles to the left, and vice versa. The chain of transmission from lower arm>shoulder>muscles of the back>rider's pelvis>seatbones is palpable (maybe sometime someone finds out the different participating muscles?). Update 06.03.18: Same level as Newcastle? At least regarding the switch wastage I feel coequal to Newcastle meanwhile: My current natural switch (an apple shoot, dried according to Bent's tutorial) I have in use since more than four months now. Newcastle/Cavendish proudly reports in his first book, that his switches last up to three months, as evidence for his gentle treatment of his horses. One could argue, that he surely has worked more horses per day than me, on the other hand he writes, that he not seldom works 5 horses within 60 minutes, so the duration of use might be comparable, after all. AND: he always wore spurs additionally, which I have never put on for 17 months now! In his second book,nine years later however, he writes that his switch endures 6 months, and at the end of this book he even mentions a duration of one year.... I wonder, if my little stick will keep this long? During my night-duty yesterday, just as I passed Remlingen, the village where Loehneysen wrote his „Della Cavaleria“, it occurred to me that the chapter 7 of book II of „The Cavalerice Francois“ I'm translating currently, is actually the one Gueriniere refers to in his chapter „Passage“! Update 18.03.2018: The long awaited snafflecurb has arrived! I had needed several months to realize that La Broue’s and Gueriniere’s “Simple cannon” (ital. translation:”simple thick pipe”) in reality is a curb with a broken mouthpiece, and some more months to realize that this was the most favored bit of La Broue and Gueriniere, then several weeks of planning and scale drawing with making adjustments to my horse's mouth-width, then some weeks of interchange of ideas until it was ready. This snafflecurb is made with a broken mouthpiece exactly after my wishes. From now on I will be able by twitching at the inner rein to push the horse's lower jaw to the outside (which is the main use of a snaffle) and just after that use the uprighting curb function. The mouthpiece gets thicker to the outside conically, to be sustained by the side lips of the horse, too,so that a pull on the rein first reaches the lips and only a stronger pull the tongue and the bars. It was made hollow for a smaller weight, as the old did, during the golden age of academic riding (Löhneysens called those „Hohlbiß“). As its diameter in the region of the bars is bigger, it is less hard on them. Being my first bridling of this type, I didn't dare for now, to let the lower branches be made as long as Gueriniere and La Broue recommend, instead I tried at first 18cm. To let the leverage not grow too great, I let the upper branch elongate to 7cm, just as Gueriniere's (correction half a year later: they used only 6cm). Thus the leverage grows only from my former curb = 1:2, to 1:2.5 (with Gueriniere and La Broue 1:3 is a normal value). By this I gain an 1.7 times longer rein way, which means for example: from 4.4cm to 6.3cm. That means my horse has much more time to sense a tightening of the rein before the curb is fully engaged and also that I could ride with a more unsteady hand. The weight of this prototype is, despite the longer branches, the same as that of a short dressage curb plus snaffle-bit, or of one of the heavier El-Mosquero curbs. The curb tells the rider similarly as with the Renaissance-curb exactly the moment it begins to take effect, and after short probing I had learned how to twitch at the inner rein. The positioning of the head then is actually as La Broue describes: nearly only the head is positioned, with only a slight bending of the neck. Showing the horse additionally the switch on the outside led to a more rounded neck as before with my old curb, and the muscle bump behind Picasso's atlas was gone, and I hope very much, it stays this way! One drawback: the little chainette, holding the lower branches together to prevent the upper branches leaning into the teeth of the horse and also the long lower branches, both forbid me from now on, to let my horses nibbling twigs from bushes and trees along the roadside..
As the long lower branches of my snafflecurb are in danger to touch the ground and engaging the curb by this, and also the danger exsits, that the horse's hooves could touch the lower branches, I'm forced now to position the horse's head significantly higher. With the old curb I often had let the reins hang through while strolling cross-country, which resulted in my horses going far forward downwards (not least in the hope to catch the odd blade of grass): they now keep always a wonderful, very smooth contact to the bit, which produces a continual communication to the rider's hand. My impression is, that this trusting softness of the horse's mouth is due to the length of the lower branches: even when the rider's hand is sometimes held a little bit unfocused, it does not lead to full engagement as soon as with the old curb, as the rein way is far longer. But also the very big mouthpiece seems to play a role, and the facility for the horse to position the now movable two shanks in the mouth where he likes it better. Also, at least in the longer necked Picasso, the reins come off the front rims of the shoulderblades (which I always have the feeling of diminishing the horse's forward impetus), and run now a little bit before the shoulderblades, because the position of his head is higher. Very interesting text found with Prizelius! (see Finds). The text by Prizelius arrived just at the right moment for me: for many weeks now I have a standstill in trying to produce from a very shortened walk a diagonalization. Only very rarely I got, for one or two steps, the impression of successfully joining the movements of the hindlegs to those of the frontlegs. Because of this I had reasoned for a longer time now, if it might be possible to reach my aim by shortening the trot further and further. Both my stallions give my since many months a very slow trot, which lets my sit very,very softly on their backs. The tact frequency of this trot of ar. 80/minute is much nearer to a trot-passage than to a piaffe on the place. But ist shows not the pronounced lifting up from the ground as is characteristic for trot, piaffe and trot-passage, nevertheless it lifts the rider clearly in very good swing in a two-beat: This must be the feeling Saunier will have got from his "walk"-passage, I assume. Might this be already this gait? At least the way could be the right one. Possibly there is a walk-piaffe, too? 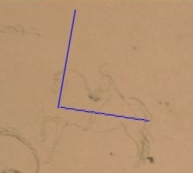 In an old video of the spanish riding school in Vienna one can see two horses moving on one place in very slow trot more near the ground. "If a movement feels comfortable for the rider, it cannot be bad for the horse" is an old saying: so I'm quite sure, that I will not make a mistake by this, but to the contrary will gymnasticize successfully to the positive. The old masters always say, we have to train our horses according to their capabilities, and some horses just don't lift up their legs very much and a little less gracefully than others. Gueriniere and Saunier gave the very slow trot-passage the name "walk"-passage because this movement was slower, not so abrupt and more near the ground than a normal trot-passage. The old school-walk before ar. 1750 of Gueriniere and La Broue was a simple, four-beated, collected walk with a higher forehand, as it occurs for example during shoulder-in or haunches-in. So I transform the sentence from the Dictionnaire de Manege from 1741, which can come across easily as somewhat disenchanting for us amateur riders with possibly not very perfect horses and training conditions: The walkpassage is very difficult to teach a horse: even a very good rider with a very gut suited horse needs at least three years in the manege, and if then two out of six horses become good, this is much already. Under worse conditions it needs more time accordingly. Marc Aurel uses a slight dorsal extension (over-extension of the back of the hand) in his free, right hand, while maintaining a slight bending of the elbow-joint (would the latter be fully extended, transmission to the rider's back muscles would be impossible and thus no driving impulse would occur to the horse). This movement is similar to shoving a shopping trolley with the wrist, and by this the rider's belly comes forward more than in the perpendicular pinky-push and with far less tilting forwards of the rider's pelvis. Is the arm elevated exactly this much, the pronation of the right hand cannot block the pushing forward of the rider's belly! ).The opposite, collection, is to be gained by flexion in the carpal-joint of the free hand (tilting the Hand downwards). Exactly the same result appears, when Marc Aurel's left hand in supination executes a "horizontal" Pinky-Push (another form as the above always meant "perpendicular" Pinky-Push with upright standing fists). I think that La Broue might mean just this horizontal Pinky-Push, when he speaks about the jeu-de-paulme movement for executing a courbette. Prizelius' Interpretation of the Gueriniere-seat brings highest harmonie into the rider's posture: his light supination of the switch-hand in combination wit the flexion in the wrist leads also to small approximation of this stance in the rein-hand: now the rider's belly comes a little bit more forward, the lighthly opened hands shape an imaginative bowl wherein the rider's belly nestles. The back muscles of the rider relax completely symmetrical. If one had no need for giving aids, I would ride in this posture permanently! When some weeks ago my hoof-orthopedic pointed out to me that the horizontal, reddish-bluish line, which had been discernible quite well on the inside of his white, right hind hoof, was a result of a kick by his left hind hoof, I realized, that I had underestimated the slipperiness of the meadow with its still frozen deeper ground. Tellingly this bruise must have occured during the sideways canter to his good, right side, so I'm sure, I had allowed too much bending of his neck, which easily occurs to his good side, and this on top of the ground problems! Since then I am extra careful to put only his head into the direction of movement and leave neck and body straight, as La Broue advises us! (Good thing that Picasso doesn't wear iron horse-shoes!). By the way Prizelius holds his switch hand I have come around to Gueriniere's again after many months trying out other ways: if one lets descend Prizelius' hand downwards, the rider can maintain his good posture and be prepared to grip the right rein if the need occurs, too. The strong uprighting on the first day of using my snafflecurb has never occured again, so I assume additionally to the newness of the bridle, the mares in heat outside the riding hall and the frosty weather two had played a part in that. Two weeks ago, after having ridden for eight weeks already with my snafflecurb, I had gone into the country today using again my old unbroken curb, which I had had in use for many years. The difference on this day was clearly to be felt: the horse didn't take this very fine appuy any more, but got often scuffed off by the bit fairly hard: the horse laid itself considerably more on the rider's hand, the rider's arm got tired more than with a safflecurb by the uncomfortable pulling by the horse's mouth, and the rider often got pulled out of his free, independent seat! Then, after 11 days riding-pause, having put on on the old, unbroken curb again, Picasso had found his former equilibrium again, and the light, former appuy of his mouth is palpable again. This clearly different appuy I call now "over the hand" as, contray to that of the simple snafflecurb, it is not felt as "in the hand" (with the feel of a direct connection into the horse's mouth), but more of avoiding a direct contact to the bit. If the reason for this is the thicker mouthpiece with support by the horse's lips or the considerably longer rein way, I will only be able to find out, when I can test the 3rd variant of the simple snafflecurb I intend to try: one with very short lower branches as the one in Nestier's picture. The prototype I have used until now had a far too high freedom of the tongue: so it seems to me now, that Gueriniere wanted to show us another (top?-)height of the freedom of the tongue, as then for 140 years the sketch in La Broue's book had been known in all the world (see German translation). My next one will be a mix of the freedom of the tongue like La Broue's, and the side parts made curved like Gueriniere's, which nowadays might be called S-Curb, as only after having used this one I will now, how rider and horse felt exactly in that time. This type of bridle was used for horses which had been given a good deal of education already: they at first started with a cavesson, then in addition to that used a straight snafflecurb, this at first without a chain; only after that they trained the horse on a curved snafflecurb, at first as guidance still with a cavesson attached; this combination was mostly used, when starting a new lesson. Depending of the quality of the horse and that of the rider these steps naturally had different time frames, which today we actually might shorten a bit in some cases, as we live in the time of the highest art in training horses from the ground, and using this, before and accompanying the work under the saddle, very much of the explaining to the horse has beens done already, when the rider tries the training under the saddle. Meanwhile I am convinced, that the view of most riders today, that a snaffle were the best bridle for the beginner and the young horse, is, at least to a big part, due to a misinterpretation of the old masters. This mistake occurred not least because in French today sometimes the snaffle is called “simple canon”, too. The reader of La Broue's and Gueriniere's texts learns thoroughly, that the simple canon is the very best bridle, but by this term they meant a “simple snafflecurb”, a very different type of bridling! 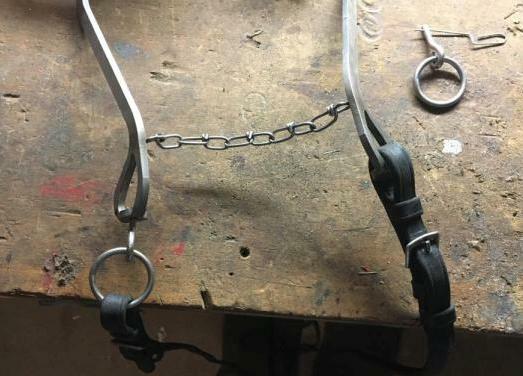 A snaffle was seen by both as an unsuitable bridle in these cases, as it leads to leaning on the bit too hard! Though other reasons surely have contributed, too: If the rider has not learned to make a halt solely by his seat, he will do it by using the mouthbit and so easily damage the horse's appuy (= leaning on the mouth) or even the mouth itself! A halt or a turning by seat only in a racing situation, for example a jumping parcours with time-accounting, is impossible actually... 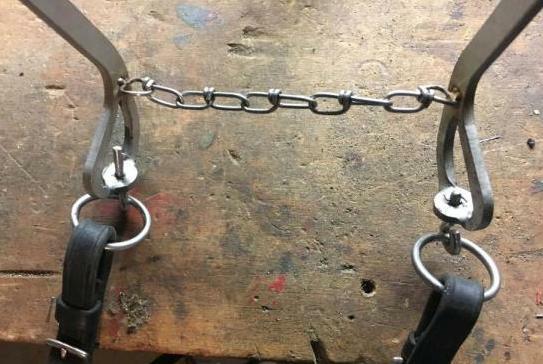 Many people think, in these situations a "little" snaffle will do less harm. Also a snaffle is cheaper to produce, and additionally the longer lower branches of s snafflecurb impede grazing during a rest, even drinking in shallow water. As much of the old knowledge of adjusting a simple snafflecurb is lost, I'm very curious if we will succed in developping it again with the help of the informations of the old masters! La Broue's lesson of the passades with doubled voltes at their end is beautiful to ride and probably really a good preparation for improving my demi-voltes in the sideways, for which I still had not found a satisfying starting point: maybe this will help? Only some days into this training it dawned on me that with two or three, he gave an incorrect number of voltes: one starts the volte at the last point of the passade by letting the outer front foot tread over the inner one, then riding a whole volte and further another half one, which is concluded by shoving the croupe of the horse inside, so that the forefeet and the hindfeet nearly simultaneously reach the line of the passade, to be able to start promptly straight forward from the hand presently to the other end of the passade. Actually these are only one and a half voltes, one more would make two and half. So La Broue's term :“doubled voltes“ in reality mean, that only the first half-volte is repeated. The perpendicular pinky-push with upright standing rider's fists have helped me greatly over many months to come away from the forehand-seat to the middle position and to unburden the horse's forehand, with higher stepping of the forefeet (I think this is an important part of „making the horse lighter“ (fr. :“allegrir“), as the old wanted us to). But hereby the movement of the hindlegs stays uninfluenced, and should one overdo it, the horse even will stretch out and an anti-collection occurs with undesirable lowering of the horse's back. With the short-backed Paco, who seldom stretches his hindlegs far out, this is not a great problem, but Picasso tends to do exactly this nearly always (I even got him tested for PSSM because of this!). For some months now I'm using the perpendicular pinky-push nearly only when the horses in the country don't want to go forward (be it on the first hundreds of meters away from the stable, or when nearing the unloved pig-stables). But for collecting the horse, meaning increased treading under also, the horizontal pinky-push has proved very valuable (though really horizontal one cannot hold his fists, only a supination of ar. 60°is possible, at least not if one doesn't want to hold the hands very far forwards). By this the forefeet are activated not as much, but the forehand is elevated a bit nevertheless, and the whole effect is distinctly collecting. This pinky-push is used most nicely and most easily in riding single-handed solely on a curb: when using a cavesson additionally, one must concentrate always on pushing the ring finger distinctly forwards , too. Finally I have a word for the movement of the switch-fist, which reigns the hindquarter so finally and precisely: "Tambourine Slew" (s. March 3rd., 2018). Having been quite astonished in the beginning about the smallness of La Broue's voltes at the ends of the passades with ar. 3.50m, meanwhile we succeed now, thanks to the tambourine-slew, to produce much smaller ones. At the moment I canter the passade, letting the horse come to a near standstill at the end, where I promptly induce a walk-volte on one track by telling the horse to put his outer leg over the inner one. With a fully inwards tambourine-slewed switch-hand the horse narrows itself maximally and is able to produce 1.50m voltes. The problem then is, that in the intoxication by these very small voltes I often don't notice what easily happens then, and only when the horse stops, I recognize that once again I have only watched the nice action of the forehand, and not felt that the horse's hind had wandered inwards more and more: that means, it has meanwhile come before the movement! Should the horse want to proceed in this stance, it would have to set the outer legs behind the inner legs, which is very dangerous! So I have to reduce somewhat the tambourine-slew for a short time, the horse gets a bit less narrow and the hind is following again on the tight circle. There is no better place to train the sideways than a row of fruit-bearing apple trees: as soon as we come near its branches, the horse's body and mind tension considerably, he stands very quiet there, reacts very finely to my demands: "You want me to move just a little bit sideways? You're welcome! ", "You want me to climb down this dry trench in the sideways, parallel to its sides, for some centimetres, or more?Certainly!" And all the time in his stance the question: "Can you reach the apple now?" Here the word "adverty" ( = advertent, mindful to the riders actions), which La Broue uses so often, feels to be fitting completely! For many years now I am trying to really straighten my horse (= getting it into a straight Straight) while using the one-handed leading of the reins. During all these years I only very seldom felt really successful and always only for short moments. Because in this way of rein-leading the place in the middle over the withers is occupied by the rein-hand, real symmetry of the rider's seat is impossible to achieve. The best one can achieve is a compensation of this asymmetrie (which of course is projected fully into the horse), as Eisenberg shows us in his pictures: In those the rider holds his hands on the same height adjacently when a right rein, for example the right cavesson rein is used (two-handed leading of the reins). With completely one-handed rein-leading, the rider often holds the switch-hand high up and almost in the middle over the withers. This way I, too, achieve my best results in aiming at a real straight Straight. Today my switch got to be a victim of the climate overheating: At 18°C and a full winter pelt Paco at handwork was as thick-skinned and inertial as an ice-bear. Called on to perform a school-halt he moved as much as a stone, so, becoming increasingly exasperated ( I had come to the stables stress-filled already) I used a more pronounced touché at his croupe, and th thin end of the switch broke off, around one year after I began to use it (s.06.03.18) . Elevating the forehand higher during canter (see 19.01.2018) is a movement my horses copy more and more into the hand-work with a cavesson, and they get much fun by lifting it higher and higher (which in the saddle rather is a settling down lower on the haunches), and also the training of uprising the horse contibutes to this. At least at hand-work I call this now, according to Ridinger: “Relevated canter on half the haunches” (Schul- und Campagnepferde, 1860, Etching Nr.18). 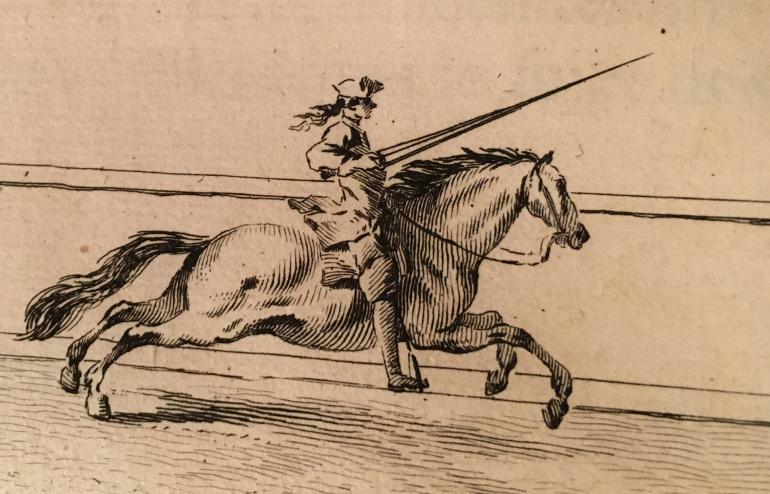 The chapter 20 of La Broue's second volume, which I'm translating at the moment, has given me so much confidence, that I succeeded today with both horses in four passades in a medium canter with increasingly better demi-voltes with elevated fore-hands, the last each wholely in 4 beats. The temperature at only 2°C helped a bit, too, I guess. If this elevating should be called „throwing the horse around on the hind legs“ as Ridinger says in one lesson, or if one should call it Sideways- Mezair, is not clear to me yet, possibly it will take some time to clearly work this lesson out properly. A very nice feeling, having understood and being able to perform and approach a sword-fight-passade! My new curb prototypes are ready: The first, a medium variant, which the old masters say should be used as the first bit after having the young horse accustomed to a straight curb, i call „normal“, the second I have derived from the Nestier etching, and the third has got longer lower branches and a high set coude departure (90°), which is supposed to produce a higher uprighting of the forehand. Testing the normal variant for two weeks has been positive, because the horses accepted very well the mouthpiece (which is the same in every variant and is very mild), chewing in another way (more contentedly, I assume). But I could not really detect a higher uprighting, which should have occurred with the normal one; here I must remark, that from the old unbroken ones I‘m used to use them extremely cautiously and very often nearly contactless. Also the „Beizäumung“/“ramener“ was only the same as in my previous, straight snaffle-curb protoytype, with Picasso already wears since several months. But with an only somewhat stronger appuy Picasso with his longer and slimmer neck, sometimes shows a false kink in his neckline, which for the moment lets me abstain from it. . Since three days now I‘m using the extremly short, and "behind the line" Nestier curb the difference at the first day was striking: Picasso wore his nose as high as if on an academic Hackamore, treading far out behind and not very comfortable to sit in trot (because of his steep hind leg pasterns). But at the beginning the chain hooks had been to short and the chain slid far to high up, away from their correct place. Today, with a better sitting curb chain and meanwhile a bit acclimatisation, it went much better: I sometimes dared to produce some more appuy; probably hereby occurred a higher uprighting of the forehand? On the third day with the normal one already the new security mechanism had to prove its worth: while Picasso was drinking on the way home in the dusk in shallow water, I eyed suspiciously the long lower branches tilting backwards , but lost sight of the left rein on to which he promptly stepped: the security eye-bolt/splint sheared of as planned and neither horse nor rein or headpiece were damaged! For this case I had executed the rosette big enough to be able in case of emergency in the country, to strap in the rein. My plan is, to use the Nestier-snafflecurb for 2 weeks, and if have then completely finished the production of the high uprighting snaffle curb, change to it directly from the weak one, to better feel the difference. For those who want to build, or let build one of those snaffle curbs, I have put the specifications on the „snaffle curb“ page. Should a more numerous interest develop, I would be interested to find someone, who will build them for us, as I imagine to test some behind the line and others. Having experienced the astonishing effects of the Nestier curb, I have bent the new „normal“ one 1.8 cm backwards (= 2°) behind the line. This again had a pronounced effect on my horses today: both horses could take their noses a good deal further forwards, could walk much more freely with the forelegs and had a much more relevated canter! Thus I realized, that my old, unbroken ones, which pretend to be weak ones, because their lower branches are bent back, in reality are „on the line“ or possibly even harder! Because I never had been really satisfied with these, I had ridden two times for three months with an academic hackamore, which I had to give up, because one has to use to much force which damages the rider‘s seat and his shoulder joints, and it doesn‘t work sufficiently, too. So then I had to settle for riding with hanging-through reins most of the time with these unbroken bits. But with the new ones, which are really behind the line, for the first time real riding is possible: now I can really choose the degree of the angle of the nose line (the ramene/Beizäumung)! In the country, going normally, I can leave it higher, in collection I can increase it more. This „more“ I can now get in fine variations and can adjust it to Paco‘s narrow Ganasche/ganache or the weak mouth of Picasso! Big improvements are looming! The weak snaffle-curbs keep their promise fully: the horses are able now to lift their heads freely, and now I realize, that in all the years I to perished in my endeavours, to lift Picasso‘s head: the former curbs prevented that completely: my horse „took his head between his legs“! Now I can, after only two days, let my rein-hand sink about a hand‘s breadth, while using the „Normal“ with 1.8cm behind the line of the banquet. Only now can the uprighting of the forehand occur, because the horse is able to lift his head, and additionally this is supported by 45° coude-departure, if the rider shortens the reins ultra-softly: I‘m very happy! For the first time since I began very many months ago to train the Sideways Picasso had today in the riding hall an uprighting of the forehand! Because this uprighting is the indispensable premise for a setting onto the haunches, and the former curbs prevented this, today was the first time I had the distinct feeling: this is right! Before I had tried everything imaginable, to lift the head: a Touchée on the croupe or under the mouth for example, but everything produced only a very laboorios lifting of his head and this only for half a step, at maximum for a whole step, and was gone completely thereafter. The collected canter in the hall today was changed completely, too, and so much, that, though I tried three times to lenghten the strides, Picass didn’t know what I wanted: he seldom never before had cantered in a collected way with his head up! Now the improvements are accellerating greatly! Being in the country with Picasso we met a dog-owner with two bull-terriers, roaming freely. As the dogs noticed us, they began running towards us. The owner might have been able to grab the bigger one at his collar, but she stopped her movement (maybe she was afraid to be bitten?). I quickly weighed my chances in the presence of two aggressive looking fight-dogs to gallop away: but on the right was a steep overgrown trench, on the the left a field with heavy soil, and the dog owner surely would have been outraged, if we had stormed in full gallop past her; also on every escape route we would come to a tarred road, which might make a slippery gallop... So I decided to stay and try to stop the dogs with shouting, but same as with the shouting of the owner, this didn't produce any reaction at all. Then I tried to impress the ever more approaching dogs with my riding switch, which unfortunately is very weak: no reaction at all again! Then I tried to reach and impress at least the smaller one on my left side, but holding the switch in my right hand, I had to bow very far to the left side and in this moment the dog charged to us, so that Picasso sidestepped to the right which heaved me out of the saddle. When I was down the dogs charged again for Picasso who ripped the reins out of my hand and galloped away, the dogs hunting him for half a kilometer. I don't dare to imagine what would have happened, if the bridge had been as slippery frozen as two days later! Only at the next bridling up (Picasso had been received and saddled-down by friendly helpers at the stables, when arriving home alone) I noticed, that both lower branches had been bent considerably. I could bend them fairly easy with my hands back into an acceptable shape (which would suffice for a safe return home, if happening in the country), and reached the original shape completely in a bench vise. My feeling is, that this bending in such a case of emergency will take at least a little pressure off the horse's mouth, so I will nor enforce the side parts/shanks of my snaffle-curb (for the normal, longitudinal pressure in normal riding these parts are sufficiently strong). Since my new curbs have debunked all my former “backbended” ones as falsely constructed curbs it becomes increasingly clearer, that this has become the third great break in my striving to become a good rider. The first one had been the reading of Bents book “Akademische Reitkunst für den anspruchsvollen Freizeitreiter”, from this point on I knew:”This is right way of riding for me!”, the second the discovery of the many advantages of the Gueriniere-seat: from that time I dared to say: “Now I can really ride a horse!” Since my horses wear the new, really weak ones, I say: “Now my horses finally are able to move academically correct!” They lift their forelegs much higher and more spaciously, don‘t lie on the forehand anymore, Picasso‘s trot has become far more comfortable, the canter has improved drastically and the sideways has improved so dramtically, that Picaaso during hand-work with the Nestier-snafflecurb today lifted his outer foreleg in the same extremely high bow over his inner leg in exactly the same way as the etchings iog Gueriniere show us.also! Paco’s starting of the canter feels like the carriere of La Broue’s horse on the title-page of my translation. All in all they transmit the feeling to be „free horses“ much more than before. Often now I’m thinking: here the Spanish ancestry of my Knabstruppers comes to the light. I hope very much, that from now on a low Terre-A-Terre can develop, which I‘m convinced the old curbs had precluded! Because of the far softer mouthpieces meanwhile I’m able to actually negotiate with the horse’s mouth, as not every pulling at the reins leads promptly to a defensive action any more, and there are many different grades of the appuy deployable now. As my new snaffle-curbs now permit the lifting of of my horse‘s napes, and only the noses, but not the complete heads are going downwards, for the first time the question appears: how much elevating of the forehand/the nape do I want/ am I allowed to permit/ do I need? And when or in which lesson? La Broue describes the two very wrong positions of the heads for the collection: firstly: when the horse holds his nose into the wind/ holds the nose on the same height as the ears; and secondly: when the horse has his chin on the breast. He wants the horses to „hold neck and head in their middle and most beautiful position“. At the moment I believe that in high collection in walk and trot the most beautiful position of both my horses lies in the region of 10-20° before the perpendicular (more of course when they elevate their forehand). This position occurs even with the very weak Nestier-snaffle-curb. I want that a high elevation of the forehand gives the hind the possibility to tread further under the horse's belly. One should not permit a strong pressure on the horse‘s ear-salivary glands in the gap behind the ganaches-bones and has to adjust the shape of the curb accordingly, but also the way of using it to the anatomical conformation of the specific horse. For this reason I want to avoid a strong pulling at the lower branches of the curb: the horse shall take his posture freely and easily. Because I have my hands still full with the evaluation of the Nestier- and the „Normal“-snaffle-curb and am overjoyed about the „super“-uprighting by these already, I still haven‘t got to finish the „High Uprighting“ curb. And for now I actually can imagine, that variations of the Nestier-snaffle-curb will get to be the mainstream in the future for most of the academic riders: but who knows, what is still waiting for me to be found out? Paco is one of the horses which are so strong-backed (s. La Broue, Vol. II, Chap. 23), that they have to shudder themselves at the first canter strides for 3 or four times: he does this by elevating his forehand more and then wringing neck and head snake-like. Sometimes with this, he throws the right rein (or reins, if having a cavesson,too) over his head onto his left side, so the rider has both (resp. the four) reins on the left side of his neck, and none on the right side! With the old, too strong curbs often he even threw the lower branches up, leaving them standing upwards (! ), the chain completely loose, and when the rider pulled at the reins, this led to a pulling upwards of nose and head, instead of downwards. Not seldom he achieves to bring the curb-chain out of the chain-hook, leaving it hanging down uselessly on the right side of the curb. This had happened yesterday again: and if the chain is not there anymore, the curb falls through, meaning, its lower branches wander back up, forming a straight line with the reins. Unfortunately some days before I had been testing some safety linchpins and had forgotten to replace the last, heavily tested one with a fresh one. Because now the direction of pull put the force directly onto the linchpins, this weakened one broke easily and the Kloben with the rein-ring attached slid out. The chainette, which is simply thrown over the Kloben in this prototype slid off and hung down on the right side also! For riding on I then fastened the rein to the rosette, but luckily noticed after hooking in the curb-chain, that now the upper branches tended to fall inside to the teeth (the chainette, which’s purpose is to prevent just this, not being there). So I decided to take the curb chain off its hook again and ride home by using the mouthpiece just like a simple snaffle-curb. Anyway this construction I have not found satisfactory already, as the Klobens rotate not smooth enough, because the chainette tends to get rotated on them, when the reins try to get untwisted. For two weeks now I have in use the snaffle-curb with the long lower branches, which I had dubbed „High Elevating“. On this right from the start I had brought back the Klobenloch 2.5cm behind the line of the banquett, approximating 5°. The first impression of a very comfortable, very calm leading of the reins has proved correct all the time the horses are more placid and steady-going, the curb feels gentle. (A construction deficit is the positioning of the upper foam-chainette, which height I had to guess and which now lies very close to the mouth, which the horses don’t mind at all). With this curb the horses collect themselves easier and better, without a pronounced tightening of the reins, and so it seems the term “higher uprighting” does not mean a pushing higher of the horse’s nape by the rotation of the coude, as I had assumed, but herewith occurs an increased treading under of the hind feet, together with a more forward and upwards movements of the forelegs , which results in a lightening in the forehand. This one is by far my most liked snaffle-curb now! After some more some weeks I will bring the Klobenloch even further behind the line of the banquett, to ar. 5cm. As I’m training the elevated Demi-Voltes (with demi-courbettes [=mezair] and courbettes) more and more, I gradually come to realize the importance of NOT to imagine them as turns on the hind legs: because only by explicitly demanding of the horse’s hind legs to go/jump sideways on a small circle, it will stay within the lesson, which means it will not fall out of the tact or out of the direction of the movement. HAving gained a correct sideways-walk on the Demi-Volte, sometimes it will fall of its own volition into one or more little canter strides or Terre-a-Terre jumps, which is to be welcomed very much as a preparation fpr the elevated sideways; also afterwards it will much easier be able to do very tight voltes (ab. 1 – 2m diameter of the circle of the hind legs) in a very collected school-canter. Because for many years I had equaled carrees and angled voltes, and had their corners imagined and demanded as turns on the hind legs on one spot , I now have to concentrate hard to leave this pattern in favor of this small circle of the hind feet and hold this. 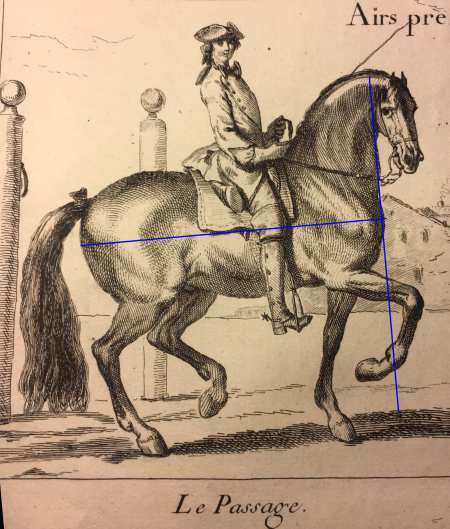 One of the causes for this mistake is Gueriniere’s unclear sketch: in the etching “Les Voltes” (normal voltes) on top we see the Carrees, which he executes really like a turn on the hind legs in the corners, in which the hind feet stay on the same spot. Though in the “voltes ordinaires” (the norrnal voltes) the positioning of the hind feet are depicted fairly well, this is not the case with the depiction of the line which the hind legs draw on the ground while stepping through the corner, which in reality has to be a small quarter-circle, matching the quarter-circle of the forelegs. 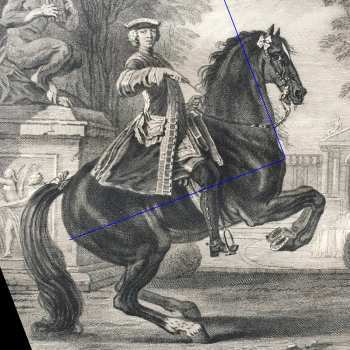 If the rider has in mind Gueriniere’s flawed sketch of the volte ordinaire, he is rather “riding the figure”, but if he has in mind the correctly rounded corners, he rather will be “riding the lesson”. The snaffle-curb „high uprighting“ is built too weak, after some time the lower branches begin to bend, the stainless steel is too soft. Would one bend it back into the right shape too often, fatigue breakage will surely occur. I will have to augment them. Possibly this snaffle-curb‘s name is only appropriate if used on horses with an ideal ganache. In his dictionnaire Garsault defines the ganache as „the groove, which is produced by the ganache bones, the extensions of the lower jaw ridges“. A horse would be the more unable to bridle towards the narrower the ganache is. Have read here again, how the art rider is supposed to slacken the reins and finally followed this advice, which most old masters give: the rider seizes the end of the reins with the switch hand, lets off the reins in the rein hand and lets the swift hand sink onto the horses neck. With this there occurs a palpable relaxation in the longitudinal axis of the horse, whose body posture had been asymmetric before by the asymmetric seat of the rider‘s posture because of the one-handed leading of the reins. Which strengthens my belief, that I’M right in changing every day the seat: one day the right-hander seat, the next day the left-hander seat, for a more equal gymnasticication of both sides (of horse and rider). emanation, also into his inner self, which produces a very high contentedness in him! I hope I will learn to use this for me quite unusual seat in every horse-riding situation, as my normal body posture outside the saddle this is not; maybe this will change, too, for better?